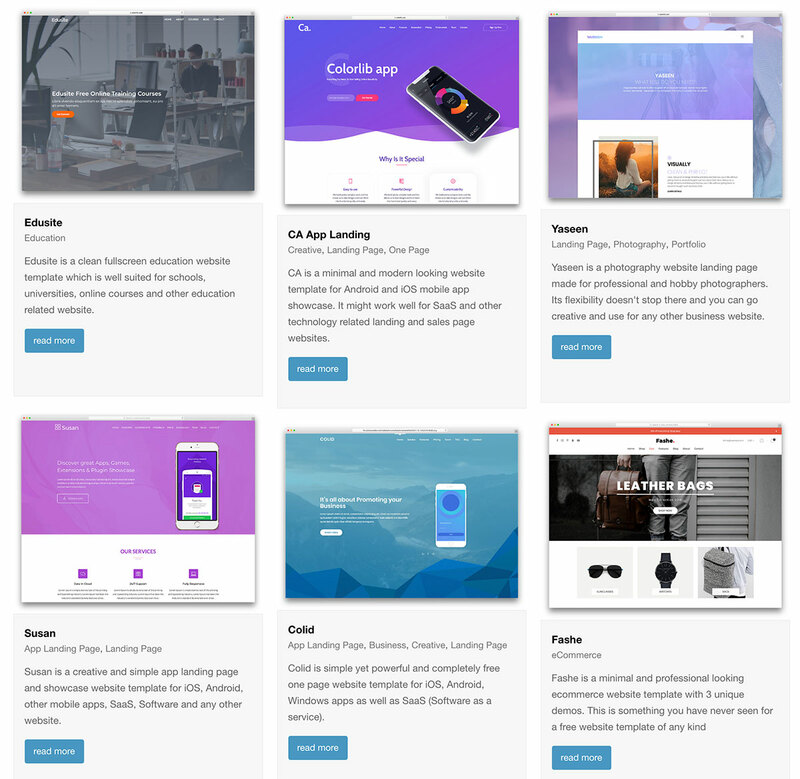 Throughout the entire collection of our best free Bootstrap 4 website templates, you are treated only with the finest tools for building professional pages. With these, you can craft any type of online project site both for your personal and business needs. Numerous developers from all around the globe are designing fantastic free templates using the power of the Bootstrap Framework. To quicken up the search process, we composed a list which helps you find the perfect template shortly. Invest the saved time into bringing the ideal website for your business into being and start promoting it ASAP. No matter the type of industry you are in, these templates handle them all with ease. Since all the templates are free, they are also a great option to get yourself familiar not only with Twitter’s Bootstrap Framework but with the whole process of building a website, too. Very newbie-friendly. Compared to the Bootstrap 3, the 4.0 version underwent many improvements to offer template developers and designers even more freedom. And you, as the end-user, are served with clean and organized products which are easy to customize, responsive and follow the modern web trends. 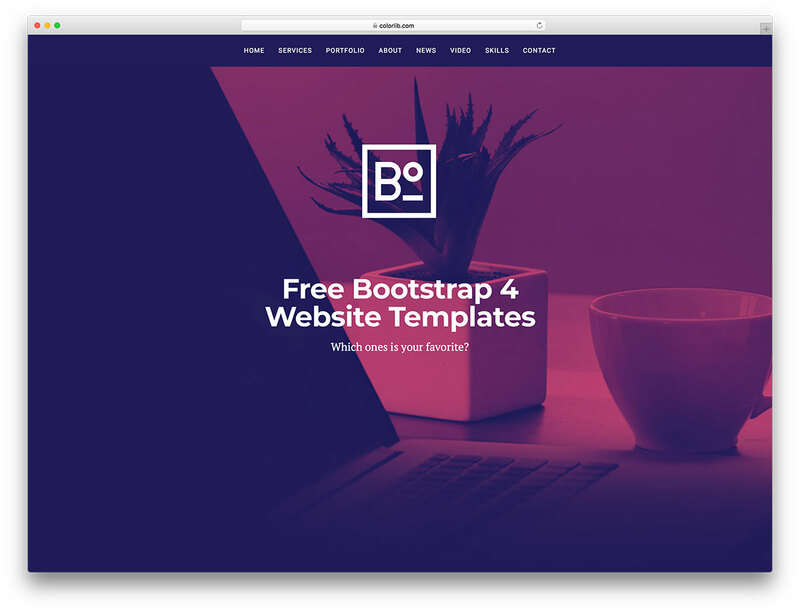 Anyone in search for the ultimate free Bootstrap 4 website templates need look no further than our best of list. Shapely is a one-page website building tool based on the powerful and popular Bootstrap 4. With its highly optimized web design and superb functionality, you can use Shapely for all sorts of aims. 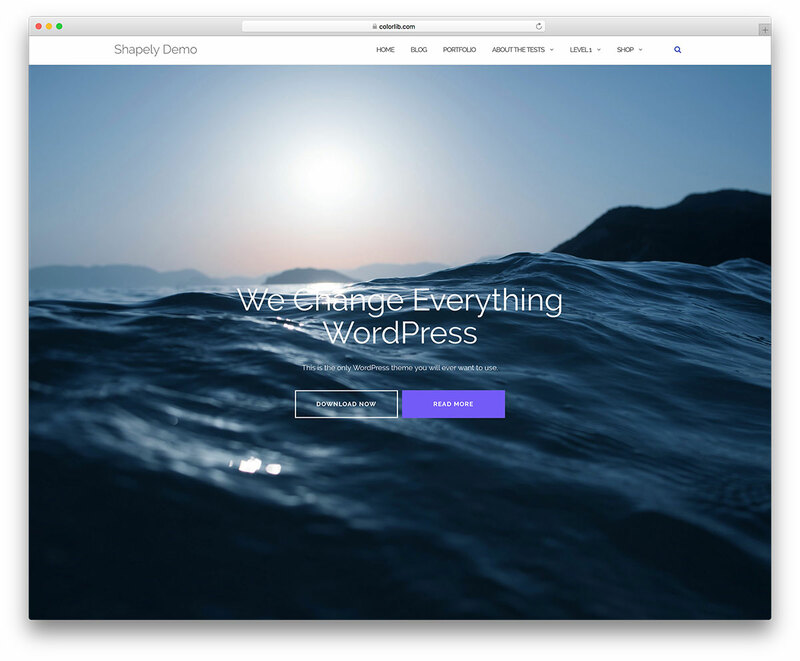 Whether for a professional or a personal website, Shapely is ready for both. Although a free tool, Shapely still has a ton of features and assets that make it feel more of a premium than a free website canvas. You can also use Shapely as is or you can freely improve and enhance it however you see it fit best. Loads of widgets allow you to customize the look of Shapely and make it follow your needs and regulations. It also supports all the major plugins, is fully responsive, retina-ready and in tune with all modern web browsers. On top of that, Shapely does not shy away from translating it and localizing the experience for your audience. If you are in need to construct a landing page to bring in even more leads, you guessed it, Landing is the tool you need. 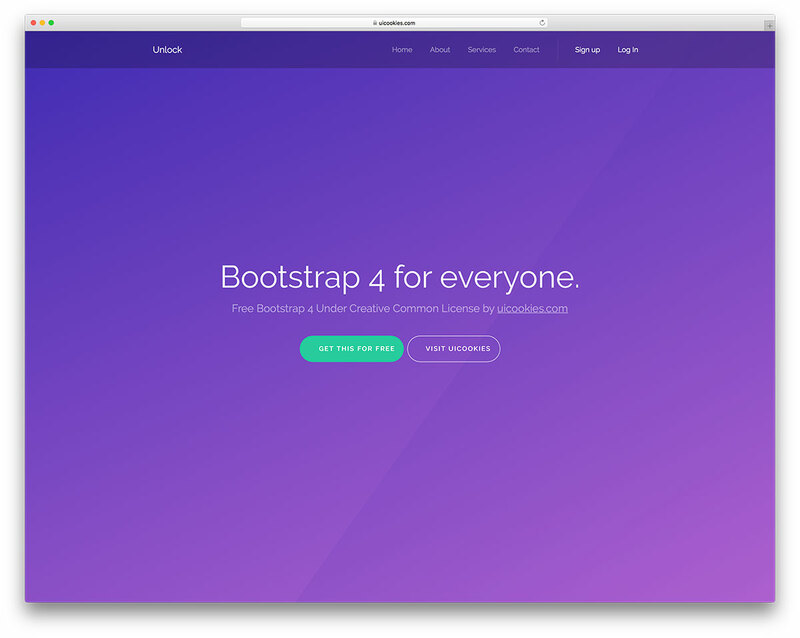 This free Bootstrap 4 website template has it all in store for you to use it either out of the box or a slightly improved version. Meaning, you can comfortably and unchallenging adjust Landing to your project’s needs and make it resonate with your audience. In little to no time, you can have a lander all set up and ready to go live. Landing is the type of a template that requires very little work on your end. It is based on the latest technologies and follows modern regulations to ensure you a steady and secure web space. 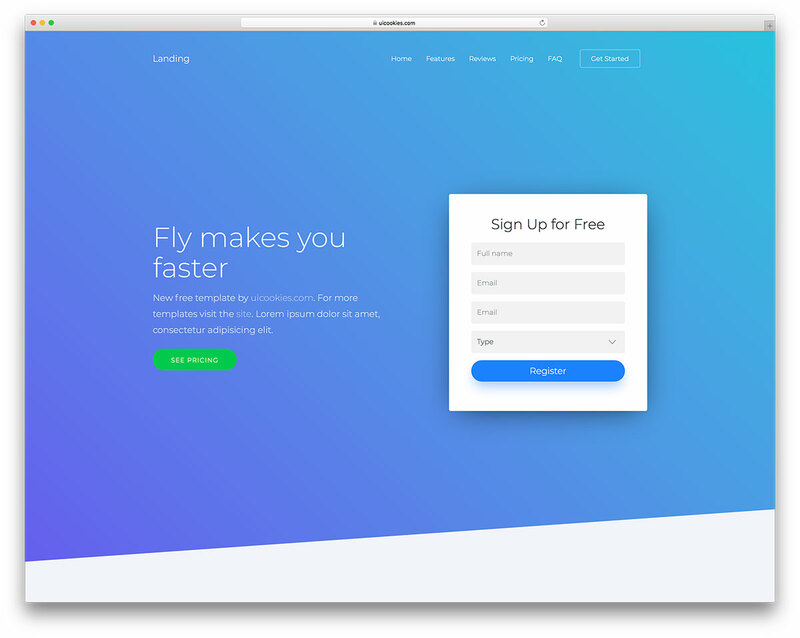 Above the fold, Landing rocks a clean form for visitors to take action straight away. Or they can browse more and get encouraged to fill out the form at the bottom of the page. A few other assets of Landing are FAQ accordions, pricing plans and testimonials slider. Unlock a broad specter of new opportunities with the amazing and multi-purpose tool, Unlock. That’s correct, Unlock is a fully versatile and adjustable free Bootstrap 4 website template which you can effortlessly alter to your needs and regulations. It is easy to use due to its organized files and code so beginners and pros can both see fantastic results for themselves with zero difficulty. Get your site visitors intrigued and interested in using your services or products and reach new successes. With Unlock, you can craft and establish beautiful landing pages for all sorts of aims. Whether it is a business lander or a mobile application showcase, Unlock is down to get busy in both cases. It is very easy on the eye what calls for satisfied clients, regardless of what device and browser they use. Get your brand recognized and spread its moto with Unlock. You are in good hands if you choose Safario and you want to build a travel website. 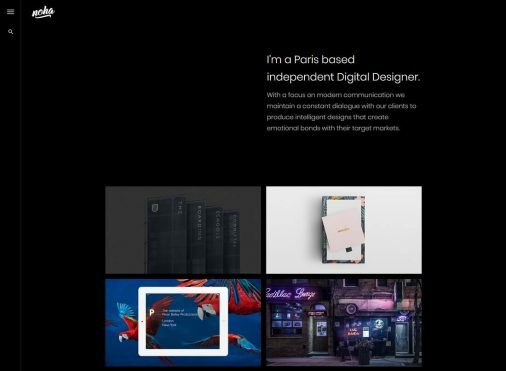 This free Bootstrap 4 website template rocks a creative and contemporary layout that will easily differentiate you from the masses. No need to really do much regarding the web design, Safario rocks a striking one already. Of course, if you would like to adjust the look slightly, feel free to modify it accordingly. Safario creates a great atmosphere that will make everyone feel cozy. It features neat hover effects, sticky navbar, testimonials slider, advanced package search form and Instagram feed. 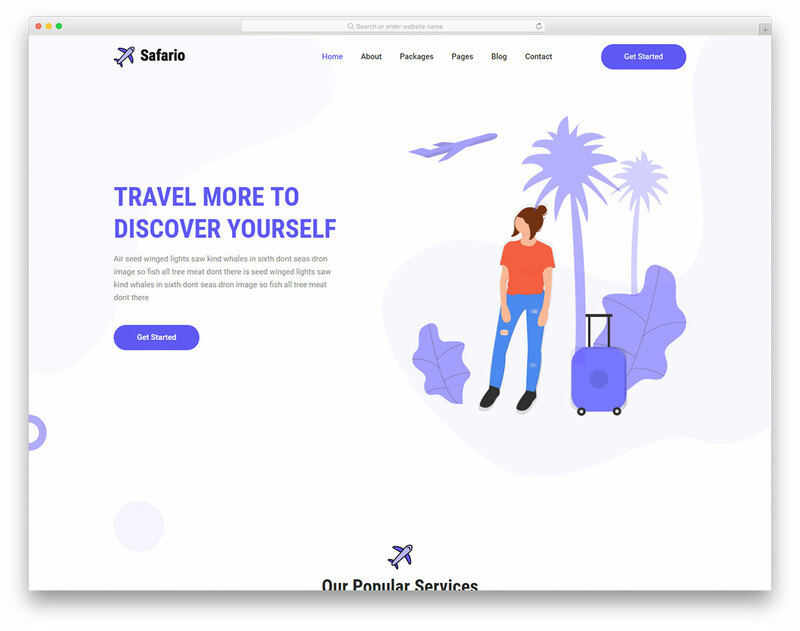 With Safario, you can also expand your reach by starting a travel blog where you can share all sorts of useful information, tips, tricks and other whatnots. In the bundle, you will discover Google Maps and a working contact form as well. 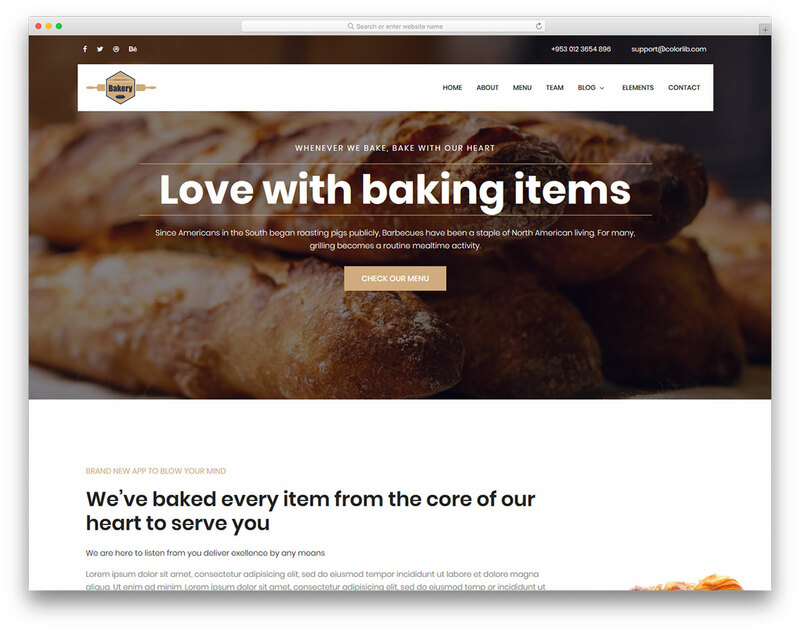 For bakeries and other food-related businesses, Bakery is the free Bootstrap 4 website template that will get you going strong. If you do not have a website running yet, you better create one as fast as possible. 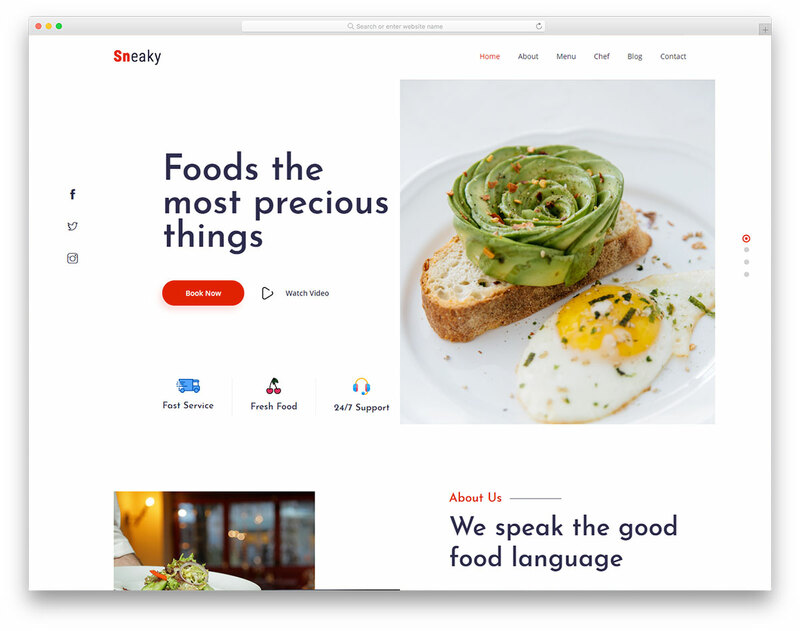 With Bakery, you do not need to bother about web design anymore. The tool is packed with beautiful layouts and elements that will take your business to new heights. Along with that, you also do not need to worry about responsiveness and cross-browser compatibility. Bakery follows all the latest trends and regulations for your convenience. Full-screen banner welcomes your visitors to your world of delicious treats. Take them on an unforgettable journey that will knock their socks off. You can also share promotional videos and build customer trust with testimonials. Bakery allows you to start a blog, too, and capture their emails with a newsletter subscription form. If you run a restaurant and you still do not have a website up, you should drop everything and start building one ASAP. Save yourself time and effort with Sneaky, a fantastic free Bootstrap website template. 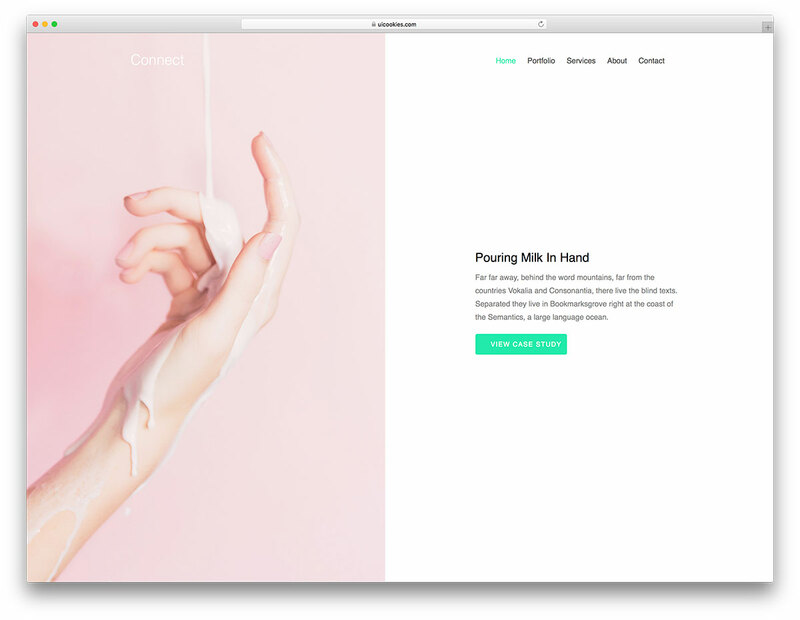 It has a super minimal, clean and tasty web design that will water everyone’s mouth. You can now put on display professional images of your delicious dishes, promote special deals and other treats. Sneaky has a cool split screen slider, food menu, as well as blog and contact pages. There is also a booking table form that helps you keep everything organized. In short, Sneaky is a free page skin that you can put to use immediately. Tweak it or use it as is, that is entirely up to you. However, you should know that the end product will surely be an enticing one. 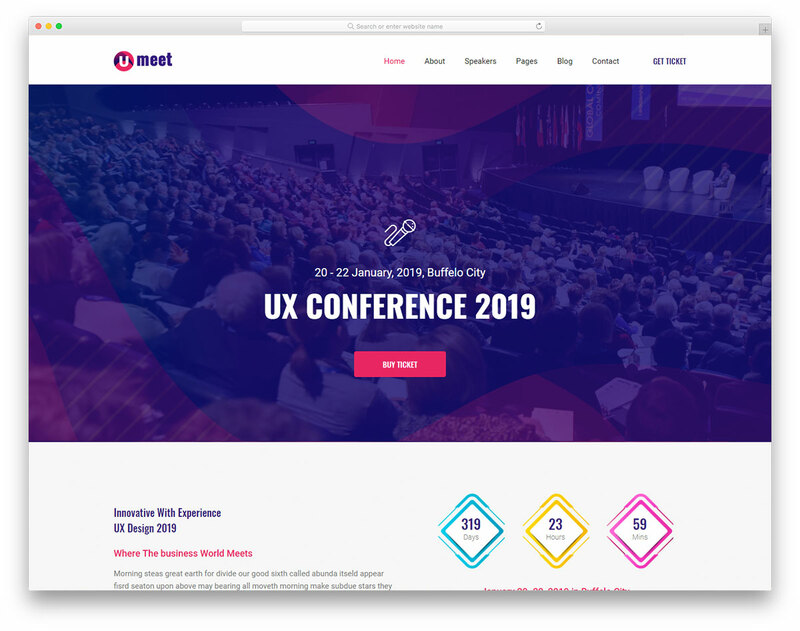 Umeet is a great free Bootstrap website template for conferences, events, meetings and forums. In fact, you will find Umeet versatile enough to work with all sorts of gatherings. To promote your upcoming event the right way, increase your reach with a website where potential attendees can learn all about the topics and speakers. Not only that, but allow them to buy tickets straight from your website. Capture their attention with the large banner and use the call-to-action button for a higher chance of getting more on board. Different hover effects, event/conference schedule, pricing plans and sponsors section are other features that Umeet treats you to. And if this is already the second or third time hosting the event in your area, share images from previous years with the neat gallery. Yogis, you will going to love this one. 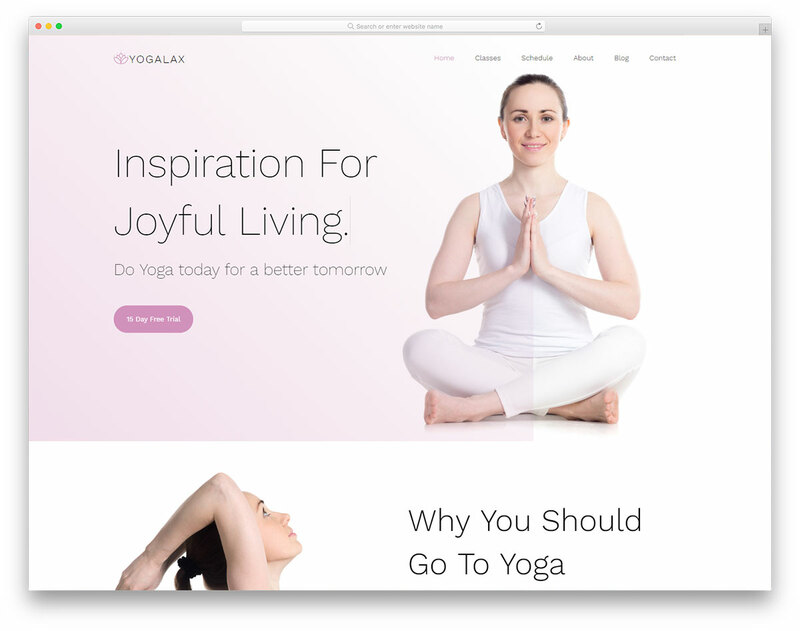 Yogalax is a free Bootstrap 4 website template with a calm, clean and professional style. It is light and bright with many original and creative features that will place your yoga studio or online yoga classes right on top. From now on, you can market your amazing talent with everyone in your local area or globally. Regardless of your yoga project, Yogalax is here to get your online presence rolling. Yogalax is, of course, mobile-ready, in tune with web browsers and retina screens. It also comes will cool features, like typewriter and parallax effects, on scroll content load and animated statistics. Share a gallery, link your new website to your social media accounts and start a blog. Contact page also includes a fully active form and Google Maps for anyone to get in touch with you right away. Hobby and professional photographers can benefit from Shutter and its elegant look tremendously. This free Bootstrap website template rocks a sophisticated dark layout with an on scroll grid content showcase. If you would like to push your distinct style, you can now do it successfully with Shutter. Shutter sports a beautiful photos page and a pop-up gallery, nice bio section, blog, as well as contact segment. You can also share your social media accounts via integrated buttons and create a complete online presence that will impress everyone visiting it. Just like all templates in this collection, Shutter is also compatible with all mobile devices, from handheld to desktop. Moreover, Shutter is retina-friendly, instantly acclimatizes to modern web browsers and performs at high speed. Enrich it with your signature style and make a big move forward to winning the online game. 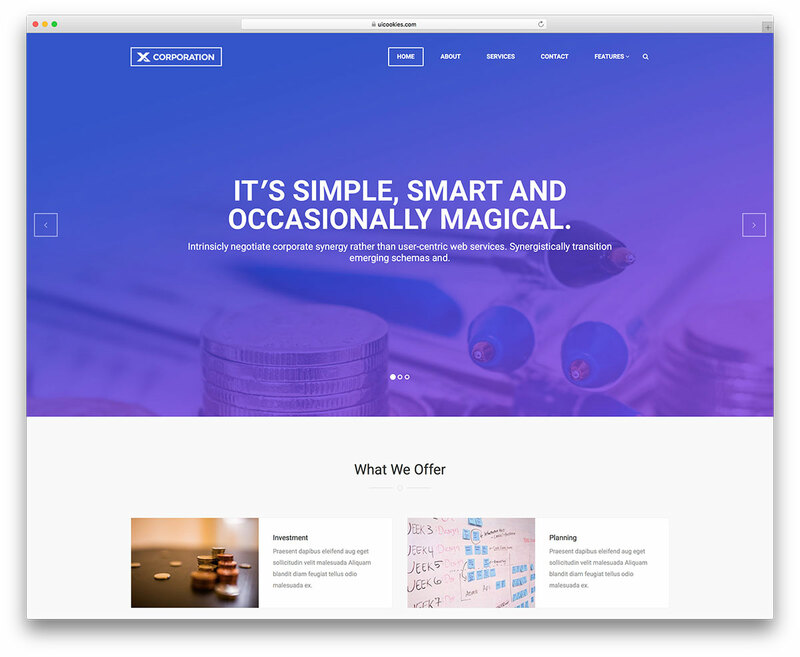 Chimper is a free Bootstrap website template for businesses, agencies and freelancers. 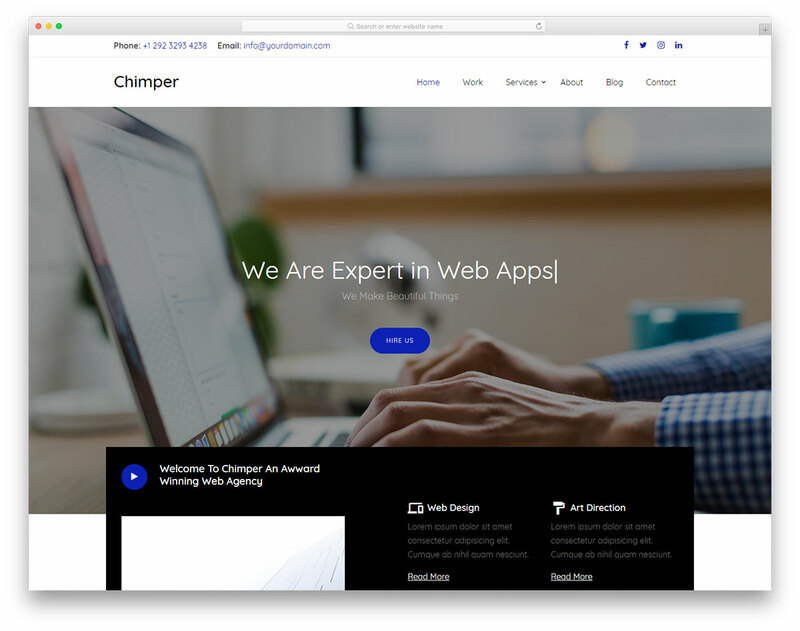 If you are looking to build a professional and cutting-edge online presence to push your services to new heights, do yourself a favor and pick Chimper. The page canvas consists of responsive and mobile-ready amenities, awesome effects and loads of convenient features. No need to waste any more time, you can take action now, download the tool and make it yours. Hey, it costs you nothing! With a parallax banner and typewriter effect, you will surely spark their curiosity and make them want to learn more about you. And if they are already familiar with what you do, they can hit the call-to-action button straightaway. To make a long story short, Chimper is a premium-like template that helps you sort out your web design in full. Hami is a free and professional Bootstrap website template for web hosting and domain registrar companies. If you are just starting out, launch a website and appear online like a pro from the start with the cracking Hami. It is a tool full of excellent features that will get you going sooner rather than later. Whether you use it exactly as is or you make adjustments to the default web design, either way, you will have a winning outcome. 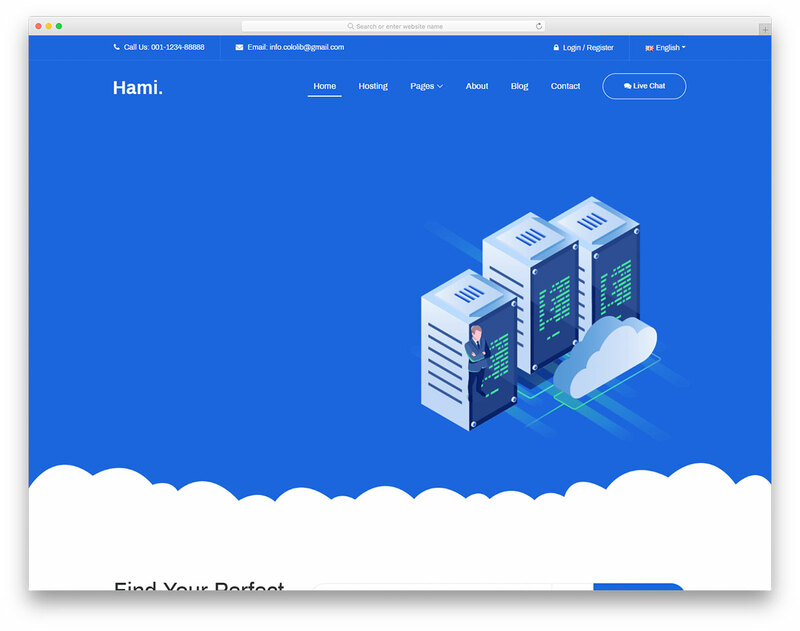 Multi-level drop-down menu, cool cloud animations, domain search, pricing tables, animated statistics and newsletter subscription widget are just a bunch of the features that Hami has in store for you. Write a compelling about section, start a blog and introduce your individual style and grow your business to the next level. 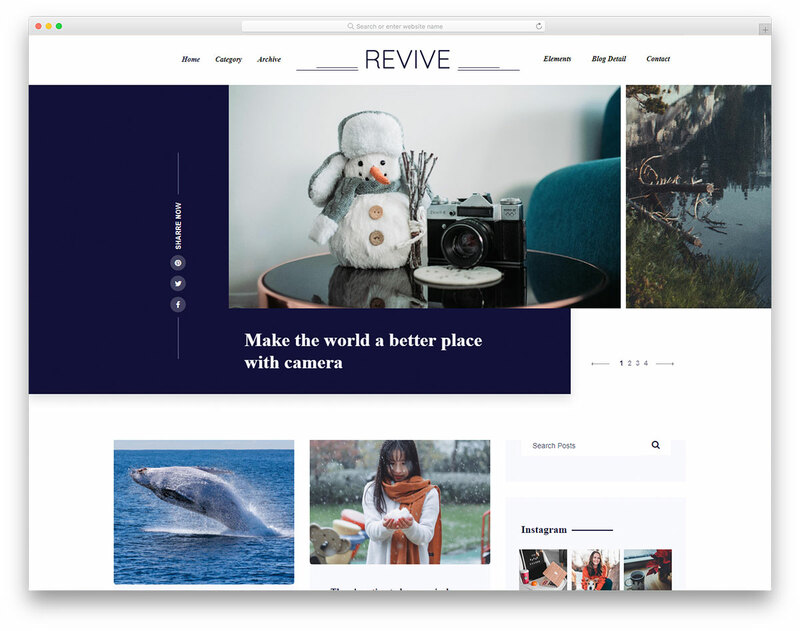 For photographers with a passion for writing, Revive is the photo blog website template that will do you well. Of course, this free Bootstrap 4 website template also works perfectly fine with other blogging ideas you may have. For instance, if you are starting travel, fashion, lifestyle or food blog, you can make it happen with Revive, too. Use your imagination and Revive will help you realize your ideal blog in a small breeze. Revive is also flexible and extendable, working fluently on all devices and platforms. It also appears stunningly on retina screens, ensuring you to display your impressive imagery with crisp clarity. Revive makes the first impression impactful with the creative slideshow which you can use for pushing the latest or most read articles. Visit the live preview page and get the gist of it. 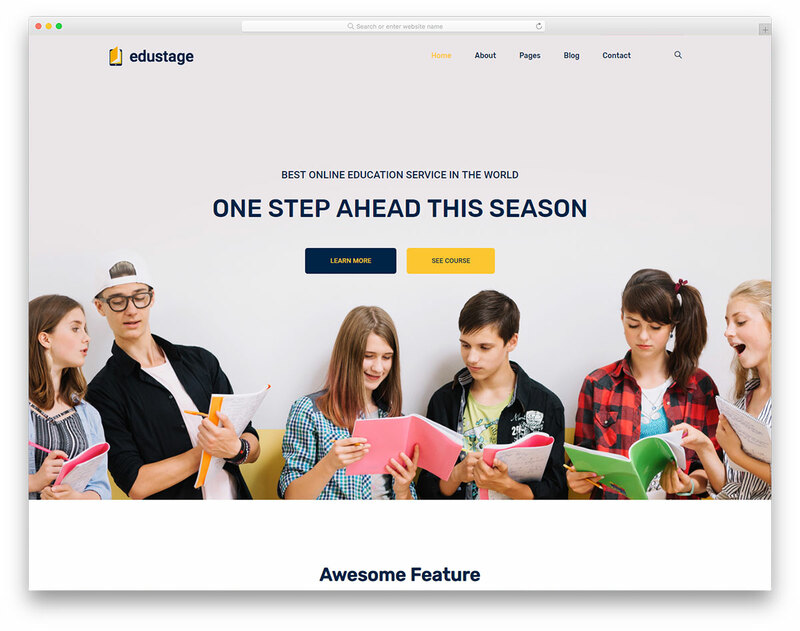 As the name suggests, Edustage is the free Bootstrap website template for online courses, schools and universities. In brief, any educational institution can benefit from Edustage and all the perks it comes with. First and foremost, your website will adjust to all screens and browsers instantly. Indeed, Edustage is mobile-ready and cross-browser compatible. The code is also well-structured for a smoother and simpler integration. Beginners, you are welcome. The overall look of Edustage is very clean and minimal. With this approach, Edustage makes sure your students are not distracted, enjoying a great experience every time they visit your platform. If you are hosting any special events, you can promote them with Edustage, too! Moreover, benefit from content marketing and start an education blog where you can go on an even more personal level with your users. The options are there; you just need to download Edustage for free and take the plunge. 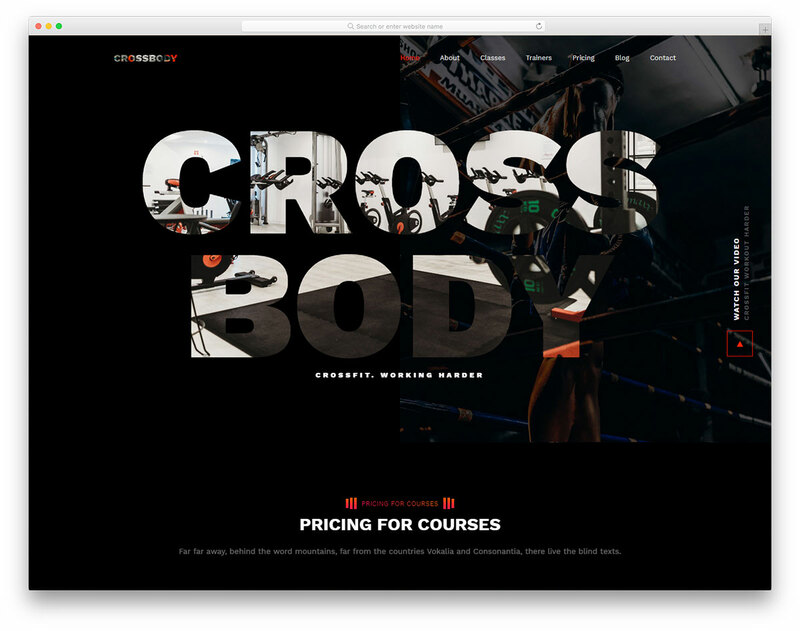 If you are a Cross Fit enthusiast who is starting his or her own project, sort out your web space with Crossbody. This free Bootstrap 4 website template is full of goodies that will help you kick-start your business. Even if you run a gym or a fitness center, Crossbody will have no trouble adapting to your needs. Crossbody has a stunning, elegant and solid dark layout that will spark everyone’s curiosity. It is flexible and mobile-ready, working fluently on all devices, from smartphones and up to desktop computers. Parallax effect, on scroll content load, animated statistics, testimonials and a working contact form are just a few of the functions Crossbody has at your disposal. Make it yours by customizing it and have an active website up, attracting new sports addicts in a few. 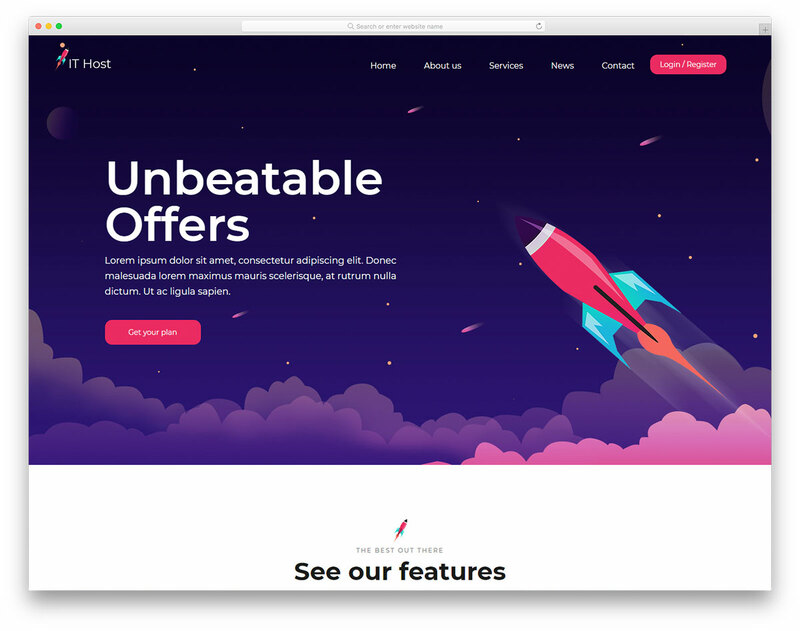 ITHost is a cool and vibrant, yet professional, free Bootstrap 4 website template for web hosting companies and domain registrars. If you are still missing online presence, speed things up with ITHost and have an enticing web space live in a small breeze. The web design is there, available to utilize it to your heart’s content. In addition to that, you can also employ it out of the box and save yourself even more time and energy. Cool animations, pricing plans, testimonials slider, internal pages and a functional contact form, you are getting all and then some. Besides, there is also no need to worry about other technical stuff, like mobile-readiness and cross-browser compatibility. ITHost thought of it all for your convenience. Start your journey on the web strong and take ITHost to your full advantage. 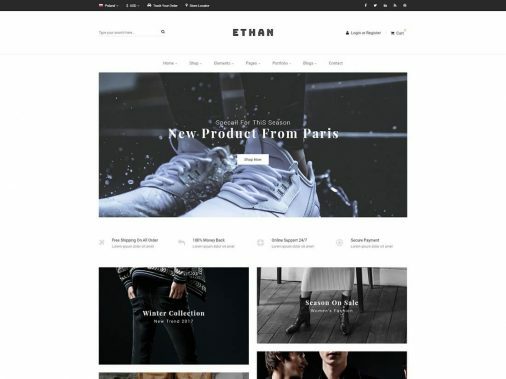 With an as versatile collection of the best free Bootstrap 4 website templates that we bring to the table as possible, you can create nearly any type of website you want. 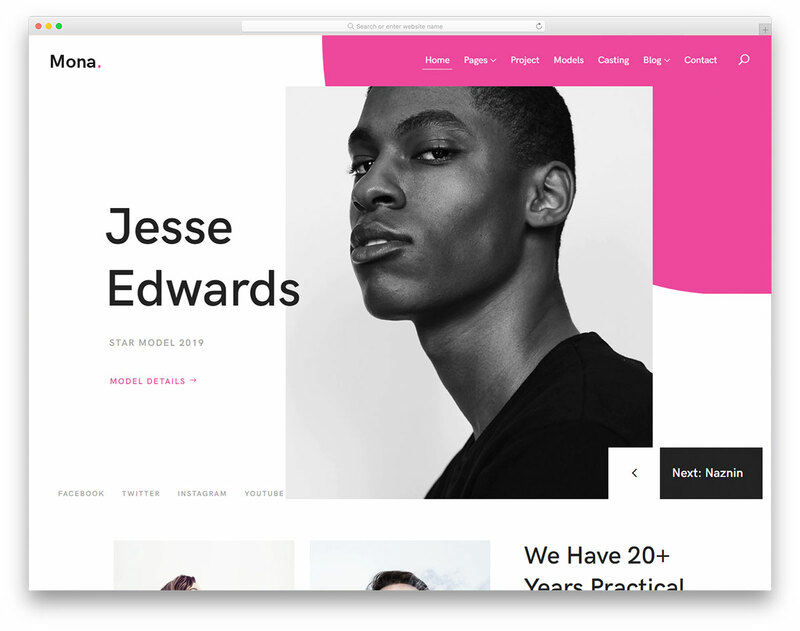 And if you are looking to sort out a contemporary and sophisticated website for your modeling agency, Mona is the right tool you should choose. The web design will fit your needs and regulations perfectly – in many cases, out of the box! But do yourself a favor and step things up with a few customization tweaks here and there. Mona is capable of bringing into being killer pages that will take your business and your models above and beyond. Mona is, of course, responsive and flexible, retina screen compatible and optimized for performance and search engines. It rocks a fancy slider, nifty animations, presents content on scroll and keeps the navigation bar in a sticky mode. Photographers both amateur and professional, you are in for a sweet treat. 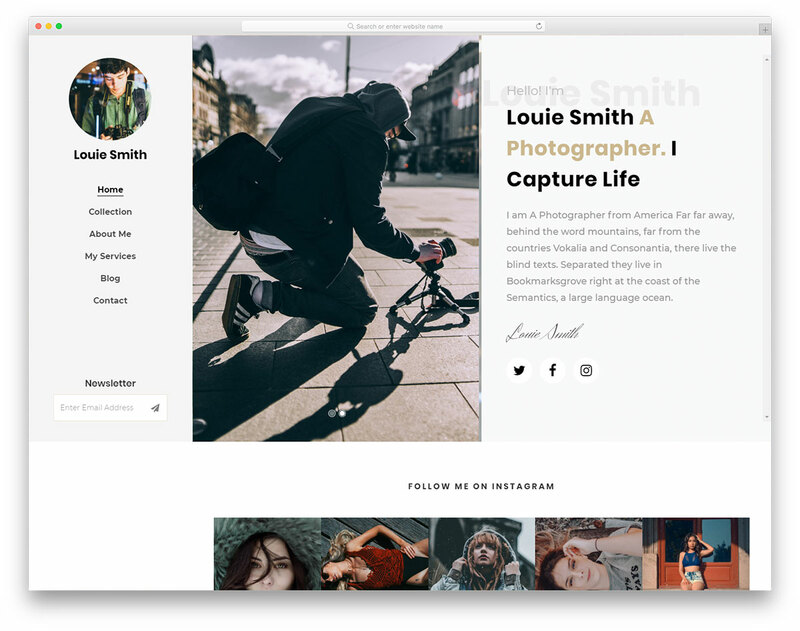 Louie is the free Bootstrap 4 website template for your outstanding photo projects. It creates an enticing web space that pushes your works to new heights. And if you would like to differentiate yourself from the competition, again, Louie is the one tool to consider using. With the web design, you can appear even more expert than you already are in your field. Louie has a sticky sidebar, split-screen slideshow, pop-up gallery, amazing portfolio page, special section for your services and a blog. Contact page with form and Google Maps is also there, just like newsletter subscription and social media icons. There you go, you can stop going over web design after web design, Louie has all the necessities and then some for a complete and awe-inspiring photography website. Building stuff online can be a tedious process, but when you have a set of tools predesigned, it instantly becomes ten times simpler. Maybe even more. If you are in the app development industry, you probably need a website to push your creations and grow the number of downloads. You can do it right now, with no investment, using Colid free Bootstrap 4 website template. You can alter the site canvas to Android and iOS apps, web applications and even SaaS. But truly, Colid is versatile enough to adapt to other businesses outside the app industry, too. 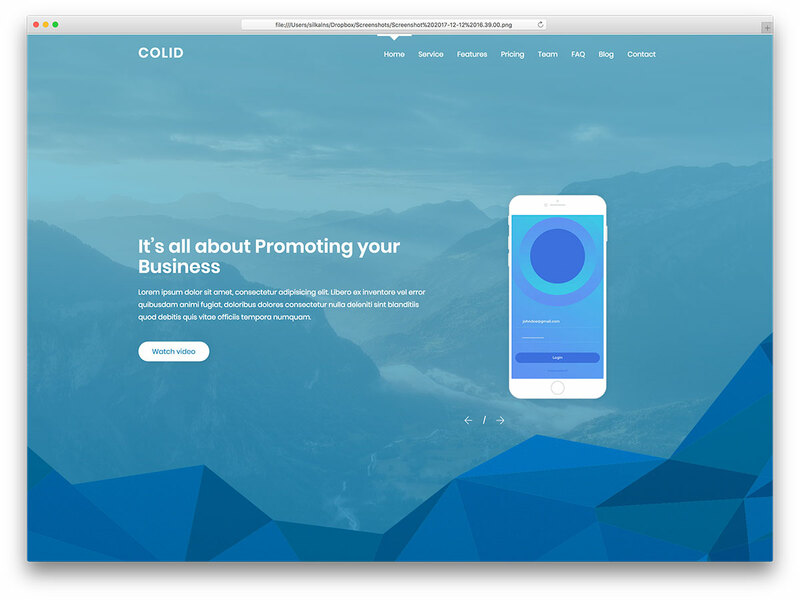 Colid is a one-page website layout with a sticky menu, cool effects, modern pricing tables and testimonials slider. Accordions, functional contact form, social media icons and blog readiness are all part of the web design. 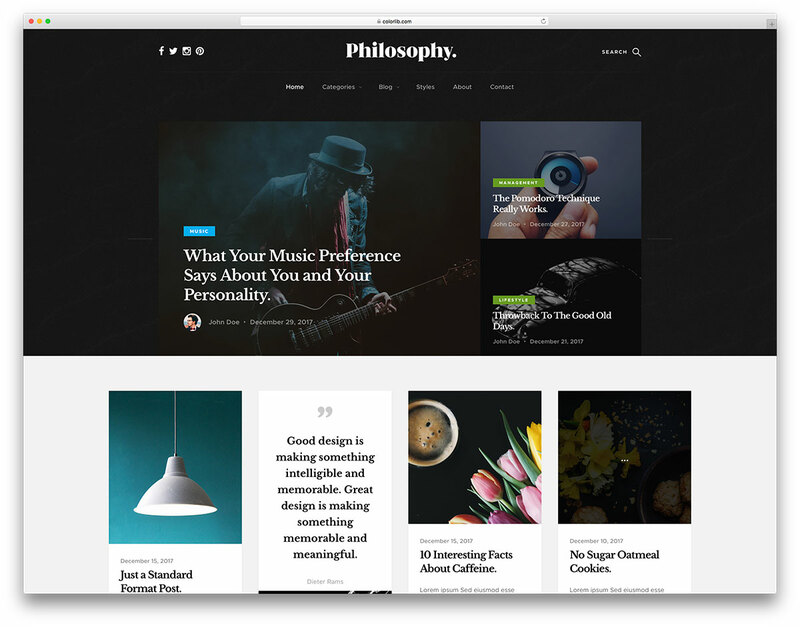 Attention-grabbing free blog template, Philosophy, helps you launch your online project swiftly. Its modern and clean design offers fantastic user experience and distraction-free reading. All your content is brought to the front in a distinctive way for everyone to enjoy it to the fullest. Philosophy has a masonry grid layout with on scroll content load and plenty goodies for a fine blog. Philosophy is perfect for almost any type of blogging. It could be food, lifestyle, travel, design, news and all the rest that comes to mind, Philosophy handles it all. Change the content and you change the niche, it is that simple. A bunch of extra features are back to top button, newsletter subscription widget, Google Maps and contact form. The blog supports all types of posts, from standard and gallery to video and audio. 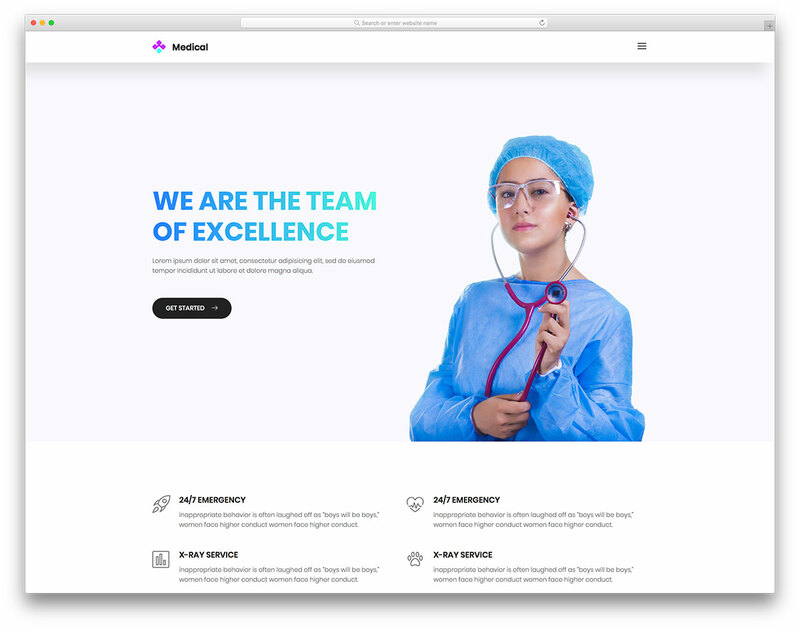 Medical is a free Bootstrap 4 website template for professional individuals and organizations. Meaning, use Medical for dentist, surgeon, veterinary, health coach or other pharmaceutical websites. For as long as you need a one-page layout to advertise your services and sort out online appointment booking, Medical has you covered. Flexible, mobile-ready and quick to edit and modify, Medical is a great choice for beginners and pros. The web design of Medical website template is clean and straightforward with all the needed sections. Right below the full-width banner is a place for services, followed by an appointment booking form for patients to use it without the need of calling you. You can also expand your business with a blog section where you can drop knowledge bombs, news and other whatnots. For consulting and coaching businesses, we have a special free Bootstrap 4 website template called CellOn. The framed layout is minimal and bright with a neat blend of white and green colors. The choice of colors is definitely very friendly to the eye, almost relaxing. Moreover, it is the organization and the features what make CellOn a template that takes care of your web presence. 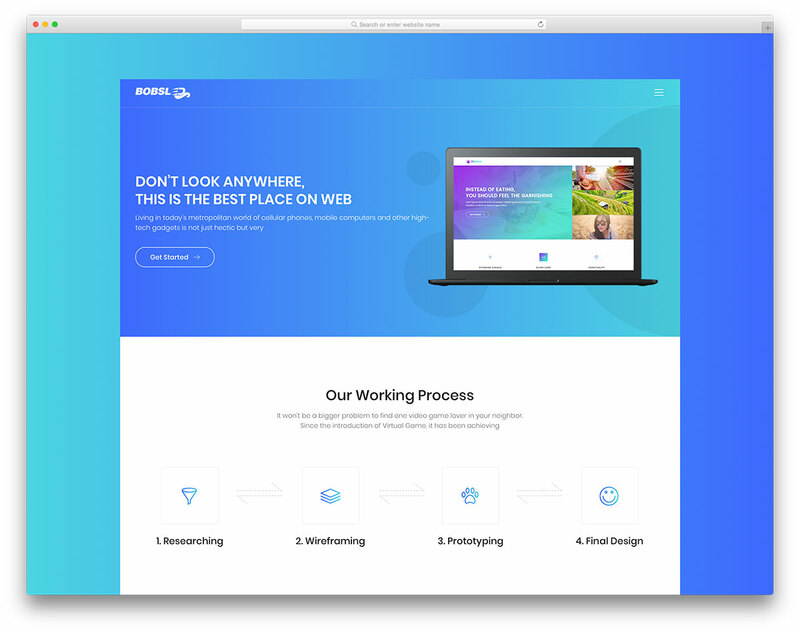 Animations, hover effects, video support, working contact form, handy navigation and functional footer, CellOn makes your project shine. No need to think twice, CellOn is responsive, mobile and web browser compatible and has a strong attention to detail. See what you can do with it by checking out the live preview page and let it impress you the moment it loads. CellOn helps you win over new clients. You do not to be fancy to use Fancy but once you do you sure will be fancy online. That’s a heavy usage of the “f” word, but we are keeping it on the safe side strategically so all good. We can do it freely and as much as we want once something is called Fancy. But to finally get to the point, Fancy is a free website template powered by Bootstrap 4 what ensures pliability. Not only that, due to the powerful framework and the use of the modern technologies, Fancy is also uncomplicated to utilize. Go fancy yourself with Fancy and start witnessing your business, agency or any other project blossom. It might happen way sooner than your initial planned. Without further ado, start building with Fancy. The name of the next template gives you a hint at what it was originally built for. Indeed, Edusite is the free education website template for schools, universities and other knowledge-based websites. The full-width layout smoothly readjusts to any device, from smartphones and tablets to desktop computers. Edusite’s first page is designed and developed in a nifty way for every visitor to find what he or she is after in a snap. Let them explore the courses you offer, introduce teachers and coaches, tell what you excel at and be outstanding as you are. What’s more, Edusite also has an addition of a fresh blog which you can efficiently use as a standalone page. 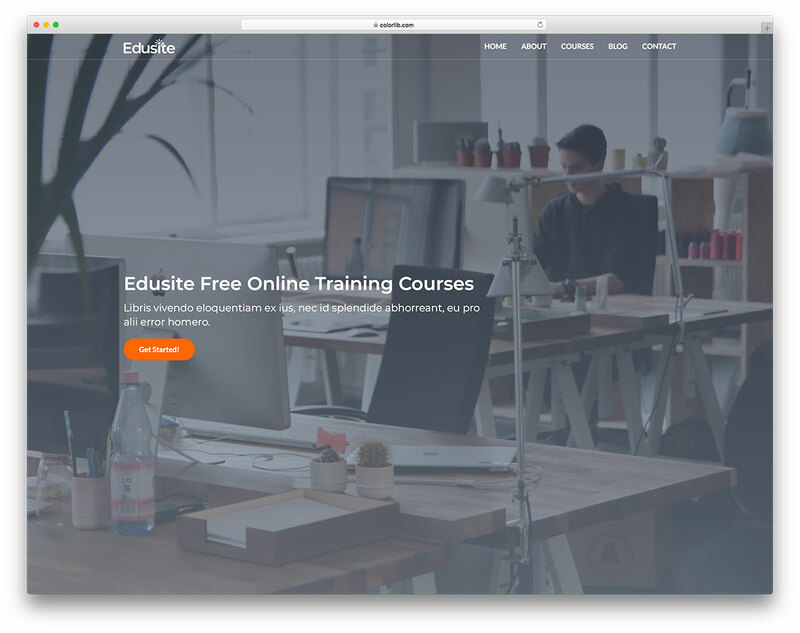 You see, Edusite is more than just a free Bootstrap 4 website template. Start blogging about whatever you literally fancy, be it education, personal stuff or any other goodness. But to really take the extra step, use Edusite in its entirety and benefit from its full potential. If you would like to get the closest to the premium template as possible, Glint template is the one that will perform the best. 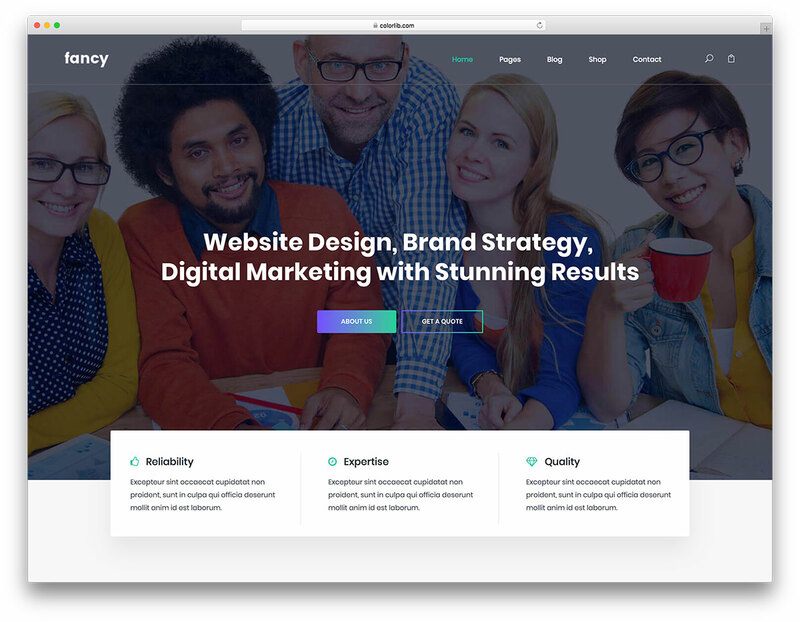 Still, what you will notice with all our other free Bootstrap website templates is that, well, all could almost be considered premium. They are all responsive and optimized to the T. They give you the freedom you need to create all types of websites quickly while keeping professionalism intact. Except for the needed credits in the footer, no one will even notice your business website was built using a free product. 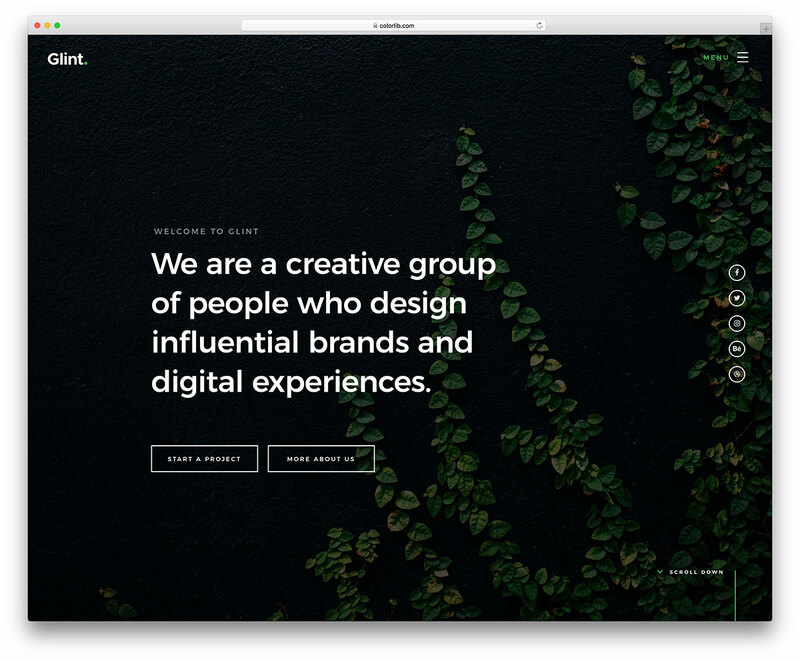 Glint is a fantastic tool for putting together websites of almost all kinds. Any company, firm and even a professional individual can use it for his or her page. It has a full-screen banner with text, call to actions and social icons. The scroll down button saves time spent for scrolling or can be used to inform visitors that more is hiding below the fold. On the other hand, once guest comes all the way to the bottom of your website, they do not need to scroll back instead use the back to top button. Lots of animations going on and content appearing smoothly on scroll will only spice things up. There is a portfolio, animated stats, ready-to-use contact form and much more what you get with Glint template. All the templates you see in this collection use Bootstrap Framework what makes them 100% flexible. Websites developed with it will not have any issue adapting to the screen size of choice. Smartphone, tablet and desktop users will all have the same experience examining your page. Datarc template is no different. It is a full-screen item with which you can construct expert-looking sites shortly. First and foremost, you already saved yourself a ton of time that you would otherwise need to come up with your own design. And secondly, you do not have to scour the web to find the ideal free Bootstrap 4 website template yourself. You have the finest gathered all in one location. You are welcome. 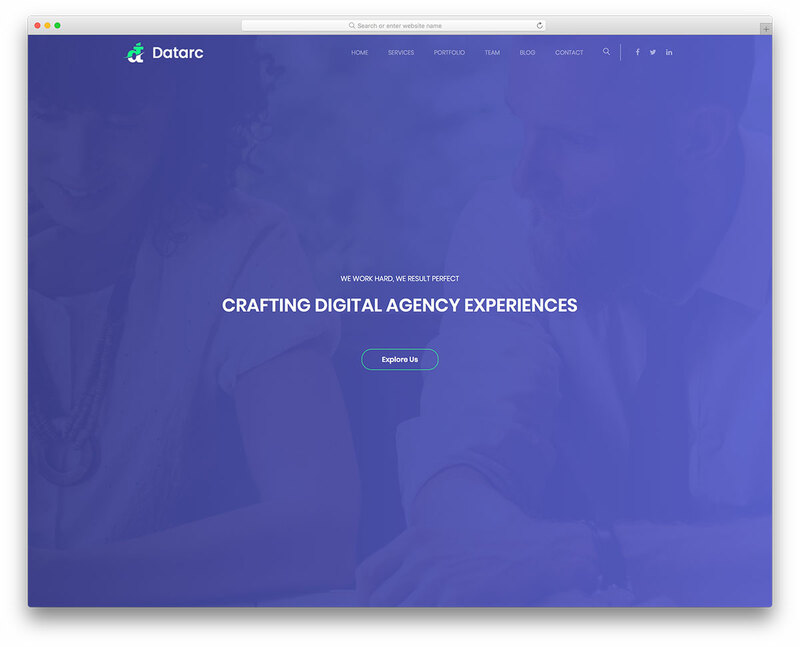 While Datarc was designed with creative agencies, tech startups and SaaS landing pages in mind, you can use it for other sites, too. If the layout of Datarc is what you are after, by all means, use it, adjust it and enjoy your freshly crafted website. Tell other businesses how you can help them out, share your services and display your completed projects with an awesome portfolio. Hover effects, team section, price tables and testimonials slider, Datarc has it all. 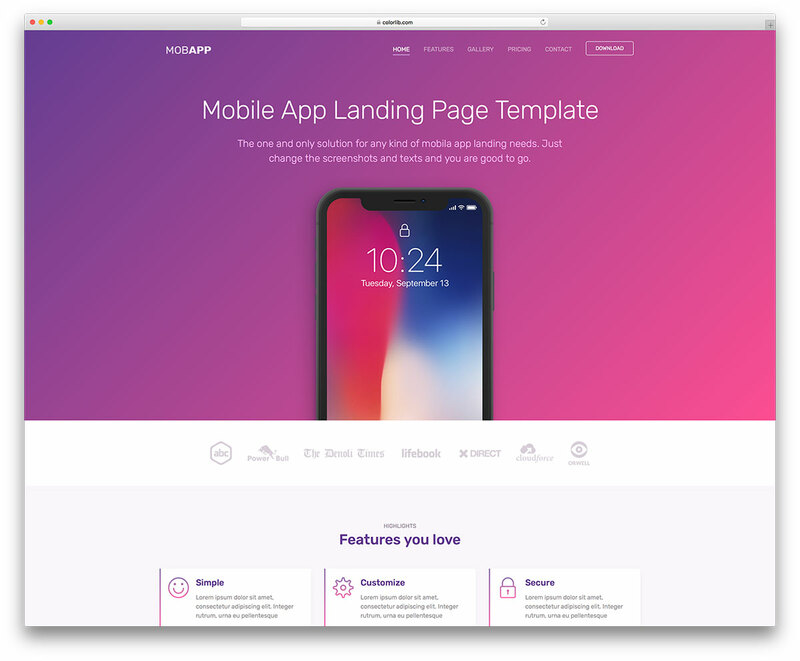 If you a serial app builder and you need landing pages for each of your creation, Ca App Landing is the free template you need. Instead of investing all the extra time into building the perfect landing page (LP), pick what is already available and adjust it to your needs. If the minimal and contemporary design of Ca App Landing is what you fancy, very little work is needed to add your product and content to it. 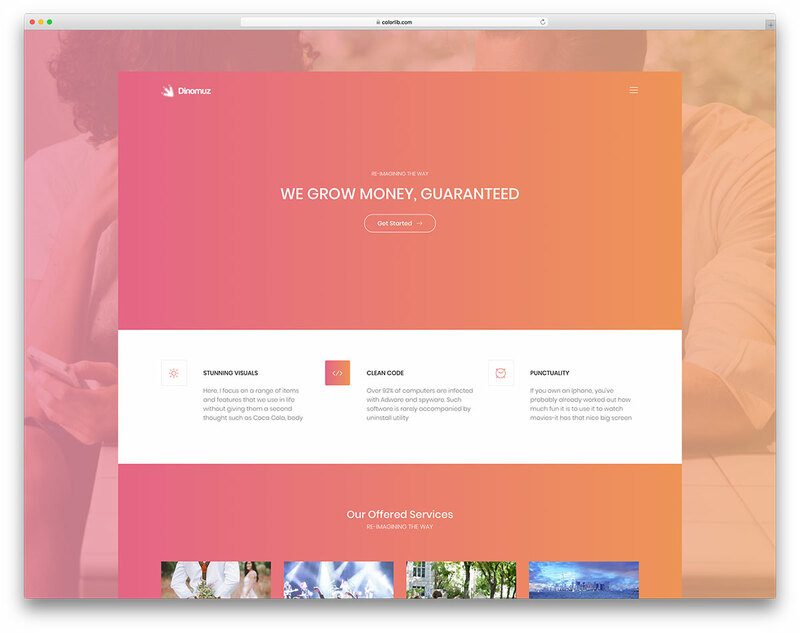 Showcase your applications in the most beautiful way with a bright and energetic LP page. Android and iOS applications just got a new home. Increase not only the app awareness, but boost downloads (and sales), too. Why your mobile app is special? Why is it a must to have it on your gadget? How can others take it to their advantage? How can the application make users lives easier? All this and more is what you can tell about your product when using Ca App Landing template. It rocks different sections which you can use for describing and promoting your product. App screenshots, animated statistics, video embed support and pricing plans, it is all already incorporated into Ca App Landing template. Start downloading now and construct the required LP for your app with a free Bootstrap 4 website template. To bring your brand to the online space, you need to spend a ton of money and time to make a website for it. Wrong. 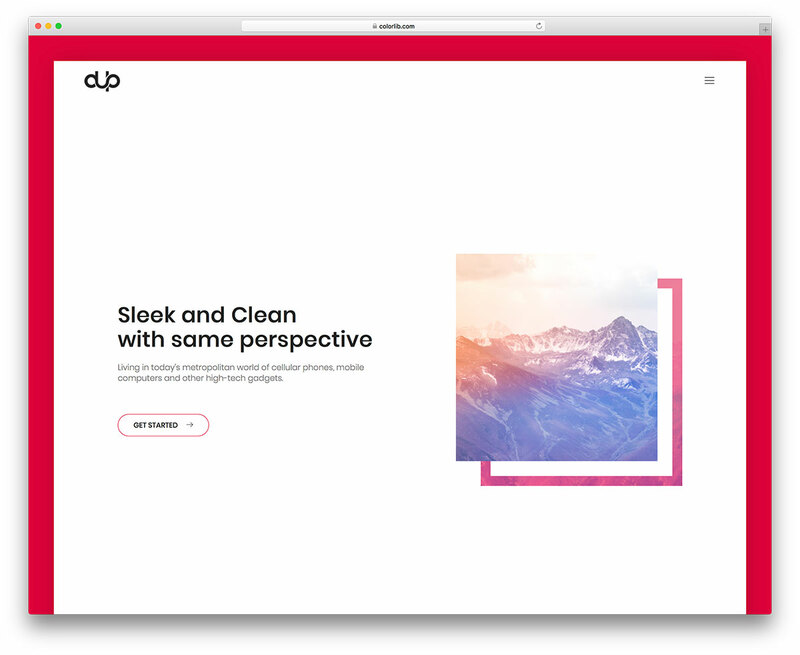 With a free Bootstrap 4 website template, like Dup, you don’t really need to spend a dime. However, a tiny amount of time and work will be needed to tailor the template to your business needs. The tool is flexible and responsive, meaning, your pages will all be mobile-friendly. Spread your name and make the whole world aware of your company and the services you provide. The final piece of web art will put an even more professional light onto your brand. We all need to thank no other than Dup. It is clean and it is bright and elegant, yet sophisticated, that’s Dup. A simple one-page website template for small and local business, like design and digital agencies. By using Dup, you will go straight to the point with what you are all about. Get people aware of your incredible achievements and tell your studio story. Add your personal touch to it and clients will easily resonate with your brand. Does this mean more business deals? Might be. But it certainly will be a deal maker if you blend it with your works and what your skills are. You might came across a creative and innovative free template, but I am sure not one was like Boxus. With its original idea, Boxus template will help you to make an impression on anyone landing on your site. But until you do not start to scroll, Boxus might look like an average tool for designing websites. All the exclusiveness happens when you reach the first chapter that’s right below the fold. The menu changes the color to the section’s and moves with it while scrolling. It beautifully highlights each part of your website what adds a distinctive touch to it. Many will fall in love with your design straight away. This will lead to learning more about your business and your work and finally get in touch with you. Experience more deals with a pro-level website that Boxus template will help you develop. Nearly any type of agency can build pages with Boxus. Display your services, portfolio and make your overall online appearance a memorable one. You will also not need to build a contact form and add Google Maps. They are both integrated into this fantastic free Bootstrap 4 website template. Some like to add animations to their pages while the others like to keep it all statics. If the latter is you, Bobsled Bootstrap 4 template is the answer to all of your questions regarding developing a website. Bobsled is easy in the looks with enough features to make almost all sorts of business websites. For as long as you do not need something extravagant and a landing page-like site is all you require, Bobsled template is your number one choice. 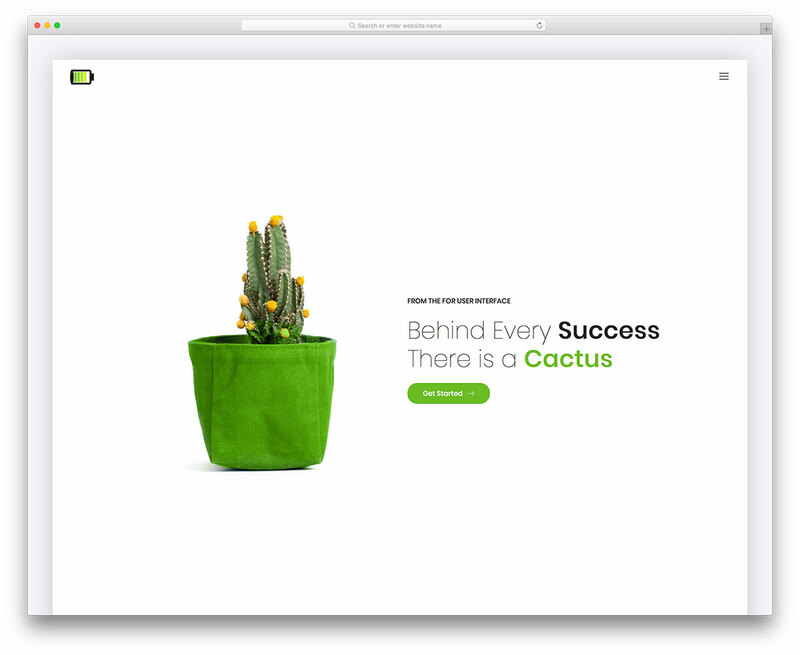 You can use Bobsled for setting up a studio page or a personal website, the template is as versatile as it can get. Doing simple tweaks can help you build an entirely different story. Eye-catching colors, working contact form, projects showcase and a newsletter subscription box, Bobsled sports it all. Even if you are new to the industry, with a cutting edge web design, you can comfortably reach the level of competition on the launch. The simplistic approach always wins big times. At the end of the day, it all comes down to your personal preferences. Choose the template that feels right and go from there. With Dinomuz, your website will shine with the brightest light, period. It is a glowing and bold free Bootstrap 4 website template which guarantees your business to stand out from the crowd. Creative agencies and studios, but to be frank, everyone with an online project can hammer out an outstanding site with Dinomuz. The final product will be fully responsive, welcoming all users to browse and get familiar with what your firm is all about. Dinomuz will befriend with your artistic mind and together you two will come up with the most perfect page for your business. Make sure you use all its features and modify the template how you fancy. Boxed layout, background image, CTAs, service section and portfolio slider, Dinomuz surely is rich in features. It might not feel like so at first impression, however, when you dig deeper, you see that it has all the needed. And that is what matters most. You can also start capturing visitors emails with a super minimal newsletter subscription box. Add social icons, contact details and brand logo, and you are ready to roll. With solid basics, you have endless options. 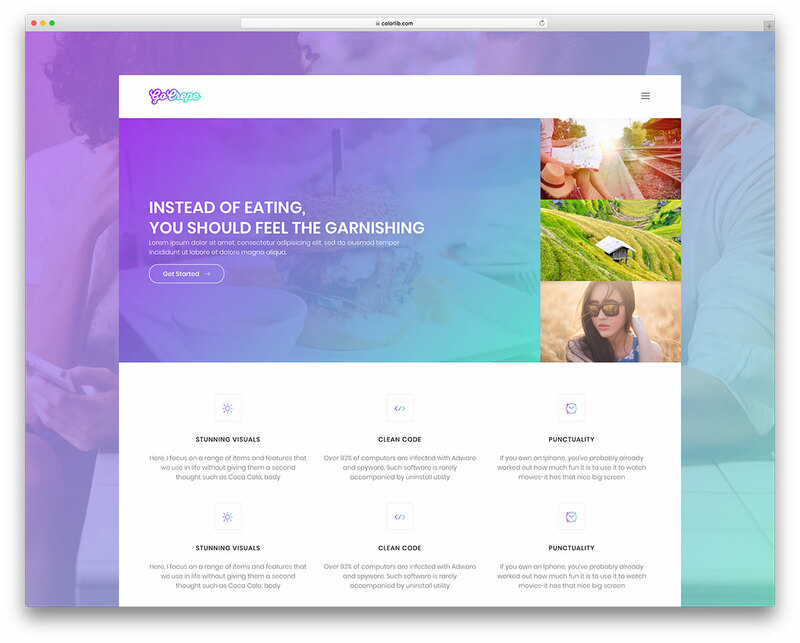 Go Crepe is one of our free Bootstrap 4 website templates which does not exaggerate with features. Yet again, there are just enough to treat you and your business right. You certainly will not feel overwhelmed. 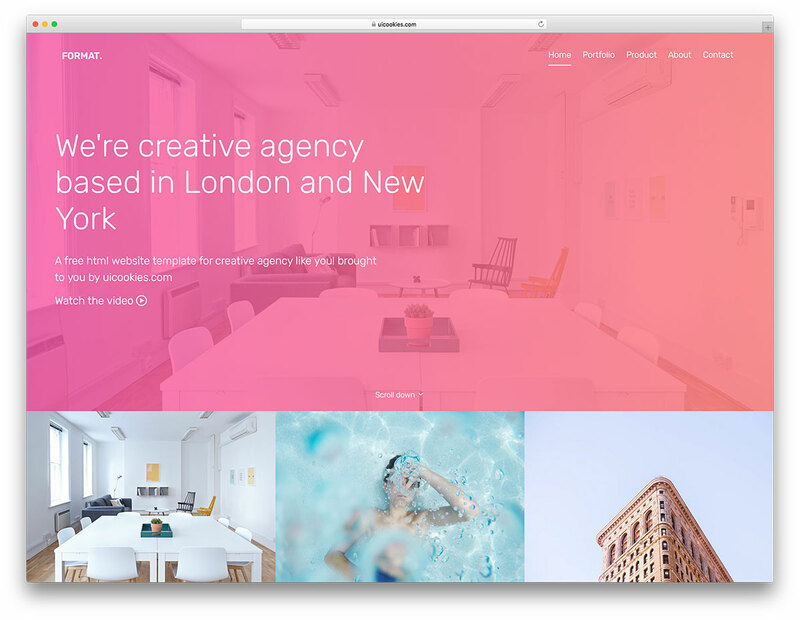 Photography, digital, media and basically any other agency who needs a creative landing style website, Go Crepe is here to please. 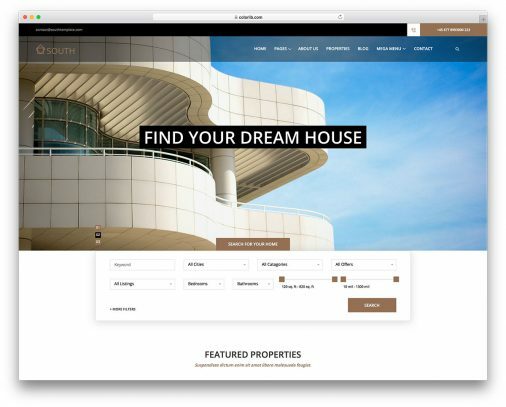 The kind of a website you always dreamt of owning, now you can with little effort involved. If the design of Go Crepe is something what you dig, I mean, why aren’t you downloading it yet? Jump in with both feet and start designing and adjusting the free template to your likings. 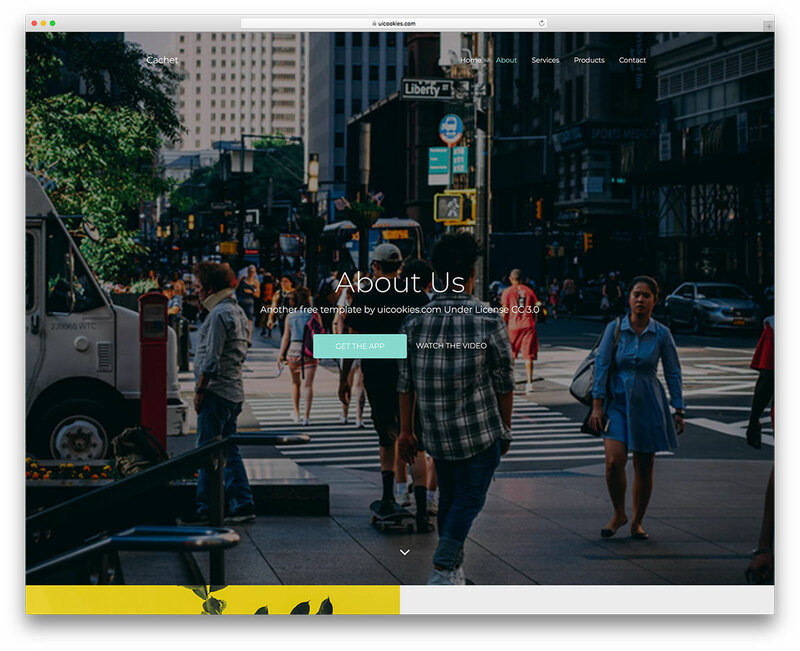 Your possible go-to template begins the experience with an interactive slider. There you can post your latest creations to further promote them. Or use the slider to push your services. Whatever suits your needs best. After all, you can go more in-depth about your skills and experience later down the page. Go Crepe has a portfolio and brand slider, to showcase your projects and brands which you work with. Newsletter subscription, contact details, social media icons and a whole lot more goodies is what you get with Go Crepe. And when you read the name for the first time, you surely thought about crepes and pancakes, didn’t you? One tool to rule them all. Saying that might not be the utmost honesty because all our free Bootstrap 4 website templates reach same levels of professionalism. Choose the one you find of the highest benefit and you will soon have the supreme page ready to hit the web audience. Have you come across MobApp template yet? If not, now is the right time to get familiar with it. The name of the template speaks for itself. What you get with MobApp is a site shaping tool for mobile applications and software. A template for landing pages which has a very modernistic look to it. Just right for app developers who need to find a way how to promote their much-wanted app. MobApp template shows your product in-depth and helps you boost downloads and sales. Let users discover your app, see what they can do with it and check screenshots. If there is not someone who recommends them to download your app, those unfamiliar with it might need extra information before putting it to use. That is what free MobApp template is the optimal solution for. Websites built with MobApp do not miss anything. Plus, by using the energetic colors, no one will be able to resist but rush reading and checking more about your app. You are as creative as your mind is. But if you need inspiration, you might find it in the free Creative Agency template. It is a flexible and adaptable product that many will find very useful for their websites. If a business landing page is what you plan to construct, Creative Agency template is worth considering. First things first, the template is free. Second, most of the work is already done. You only need to add your text and content and set up email for the contact. Add your logo, social media links and that might be all the work you need to do. Easy, right? CA rocks a full-screen header with modifiable text and call-to-action buttons. Various hover effects get some diversity going on to enhance the user experience. Beautiful portfolio section showcases your work and opens each project in a popup. Make sure you highlight what potential clients might choose you over competition and share statistics. Depending on the business you run, introducing pricing tables is a must. Creative Agency has you sorted with those, too. BBS is for the bosses who need to put up responsive pages for their businesses. But it is convenient enough for everyone who would like to push their brand image. It is a free template that comes super close to all the premium tools out there. You can download BBS straight away and start putting it to use immediately. Make it help you do its magic, craft the desired website and attract new potential customers. 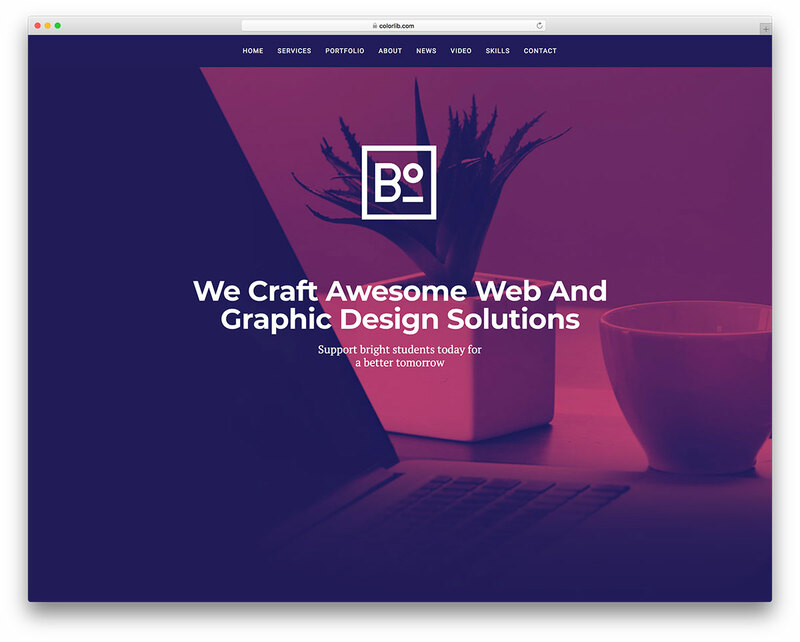 The free Bootstrap 4 website template, BBS, is fairly simple in the web design, yet it comes with many features. Big header, CTA, services, company history, mission and vision, there is a section for almost anything you would like to feature on your site. Embed a YouTube video which explains what your talent is and maybe even introduce your team members. You will be amazed by the fact how much you can do with a one-page website template regarding promotion of your company. White and purple boxed layout will have a positive impact on your guests. Moreover, since email marking is still one of the best methods of promotion, BBS’ newsletter subscription box will help you out tremendously. Get your visitors intrigued the moment your site loads for them. But how can you accomplish that? There is a massive slider that gets with Labs template which will do you nothing but good. Use it to display your latest work or purely to promote your business and services. 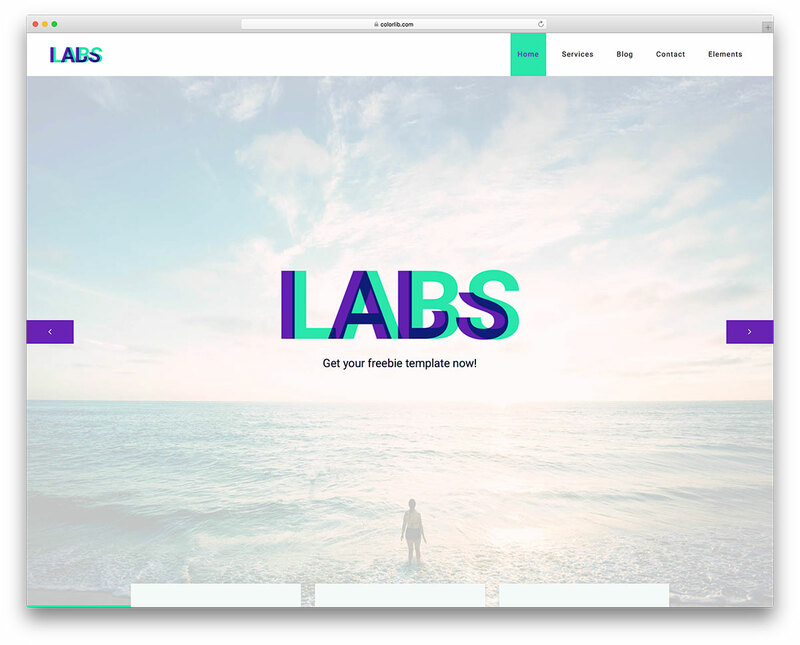 Labs is a modern Bootstrap 4 website template for digital agencies but companies and professional individuals in any industry can benefit from it just as well. It is a full-screen template with bright colors and many sections to make your business stand out from the crowd. Along with the impactful slider, you indulge visitors with your services, video, testimonials and blog. You read that correct, Labs template comes with a blog section for you to start writing a journal. Use it for content marketing or to start sharing your story and get on a more personal level with your users. Create an individualized experience for each and every single visitors. Get them trust you with honest articles and even testimonials. If you know how to execute it correctly, you can win them over easily. And when they feel ready, they will go straight to the contact form (yes, it is included in the Labs package) to do business with you. Whenever you find yourself in the position to find a template which is multi-functional, look no further, Impact is the one to go with. It comes with all the essentials and fantastic features to help you build a fabulous website. Impact is a modern template which follows all the latest technology trends. Whatever you think of, there is a good chance you will be able to realize it with ease using Impact. The template supports both single- and multi-page layouts, for you to have a wider spectrum of options. Craft exactly what you want and make your online appearance shine with a bright light. 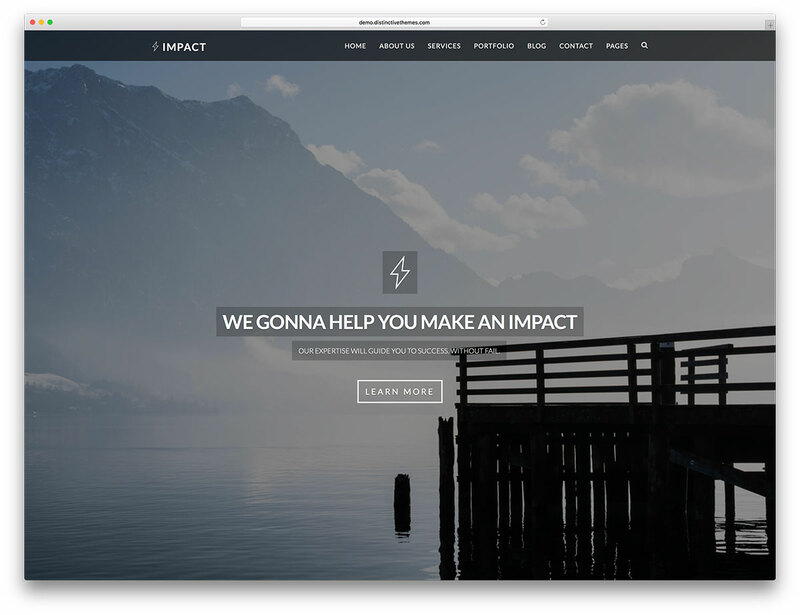 The fact that Impact is a free Bootstrap 4 website template means that it adapts to any device instantly. This calls for a superb user experience that your site will not get even close to lacking. The home page of your site will have a huge impact on every visitor with its full screen header and a full screen image slider. Make your projects grab the attention and hook each guest immediately. When scrolling, animations make different elements appear beautifully for an even better browsing experience. Pricing tabs, Google Maps and contact form along with single post and single project pages are just a few extra goodies of free Impact template. 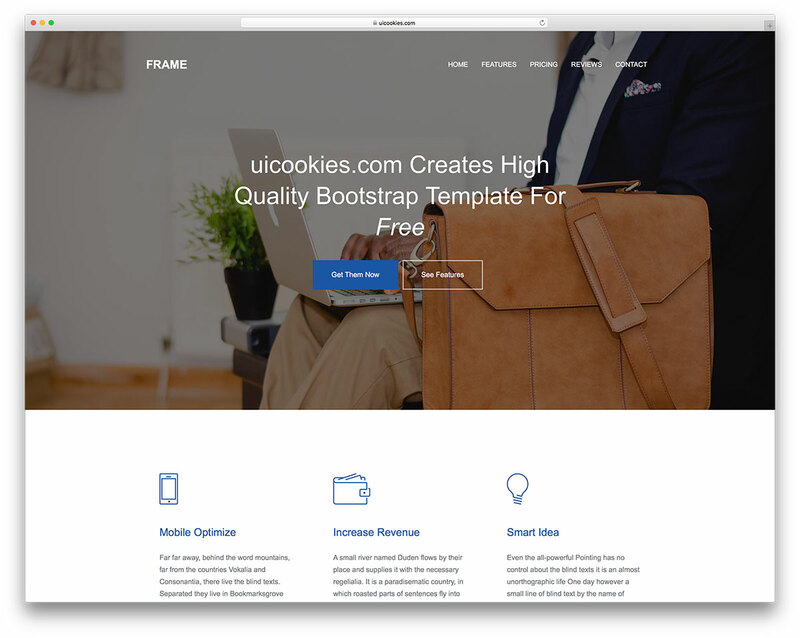 Frame is a free Bootstrap 4 website template with a one-page layout that applies to a broad range of different projects. It is a multi-purpose website skin with a neat and tidy web design that gives your brand a fresh face on the internet. It is clean, minimal and sophisticated, perfect for businesses and agencies willing to market their services to an international audience. If you are ready to scale, a solid website is a right approach to get things going. With numerous features, Frame provides the freedom you need when setting yourself up a novel website. Parallax background, on scroll content load, pricing tables and testimonials section are just a few of the goods Frame has available. While scrolling, navigation bar only appears once you start scrolling back to the top. This gives you an even cleaner and clearer experience. 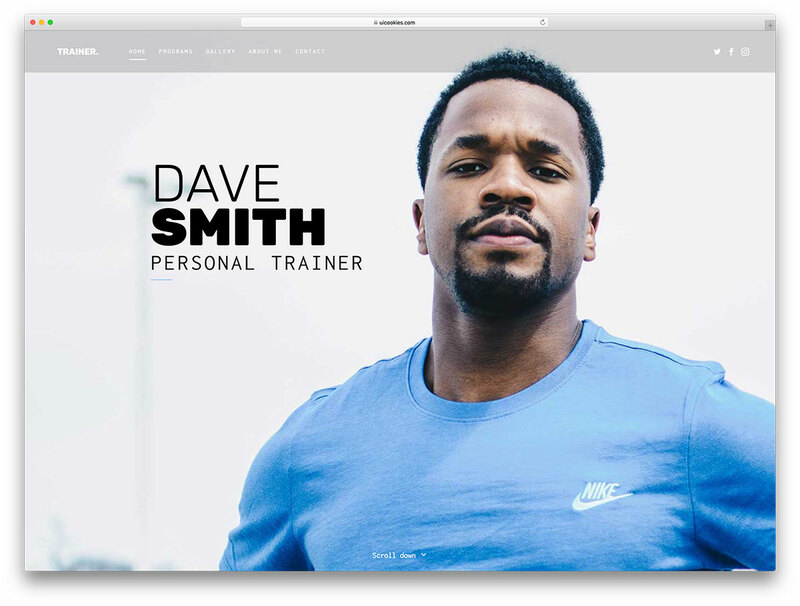 For personal trainers, even gyms and fitness centers, Trainer is the free Bootstrap 4 website template you will find of great use. Even and especially if you are an online-based trainer, again, Trainer is your best bet. Get your skills, talent and services out there, promote your work and help people all around achieve their fitness and health success. If you were focusing on your local area so far, it is time to step things up, go online and scale your business through the roof. Trainer has a contemporary and clean look that appeals to a global crowd. Not only that, due to its flexibility, Trainer works fluently on all devices and browsers. Jump in with both feet and start the process of establishing your web space and get people to access your fantastic and highly valuable programs straight from your website. That’s correct, you can do all that and more with Trainer. Whether an agency or a freelancer, you both need your space on the web to showcase your work and market your services. You are trying to bring your business to the entirely new degree, aren’t you? We all strive for something more, but it’s the actions we take that define our success. Do not hold yourself back and get busy in a strategic way. That said, no need to be doing things yourself from scratch. Instead, let tools like Pixels do the job for you while you only execute refinements to attain the web design you always dreamt about. Pixels has a full-width slider, nifty portfolio page and a contact section with an active contact form. Every section of the tool is enhanced with a testimonials slider for building customer trust. Another attention-sparking feature of Pixels is the unique footer reveal that you see rarely any use. It’s the small details that may make you stand out a mile and get visitors fascinated. All you creatives out there who haven’t yet decided whether or not to make a website, stop what you are doing. You absolutely must build a page to display your work and even offer your services to those in need. To do that, you do not have to spend countless hours designing and developing your perfect website. You do not even need to spend a ton of money to have a functional web space ready to go live. With Initial free Bootstrap 4 website template, it’s all easy. Initial has a very basic web design that is at the same time expert looking and convenient. For professional individuals, agencies, creative businesses and the like, Initial is a fantastic solution to get your name known. No need to waste time anymore, pick the tool, download it, edit it and you are ready to release it to the online space. 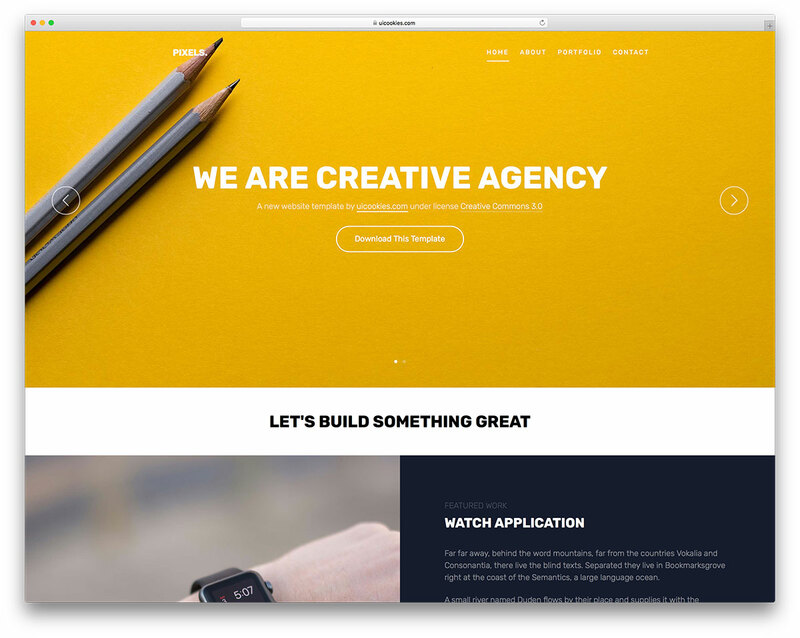 Cachet is a powerful free Bootstrap 4 website template that does not struggle with adapting to your project. It is both a one- and a multi-page website template with fantastic features and assets. With this in mind, you can utilize Cachet for landing pages, company websites and other ventures. Chose the layout that would best fit your needs and start improving and editing it with your content. With Cachet, you can have a page up really fast since it requires very little work and is simple to use. 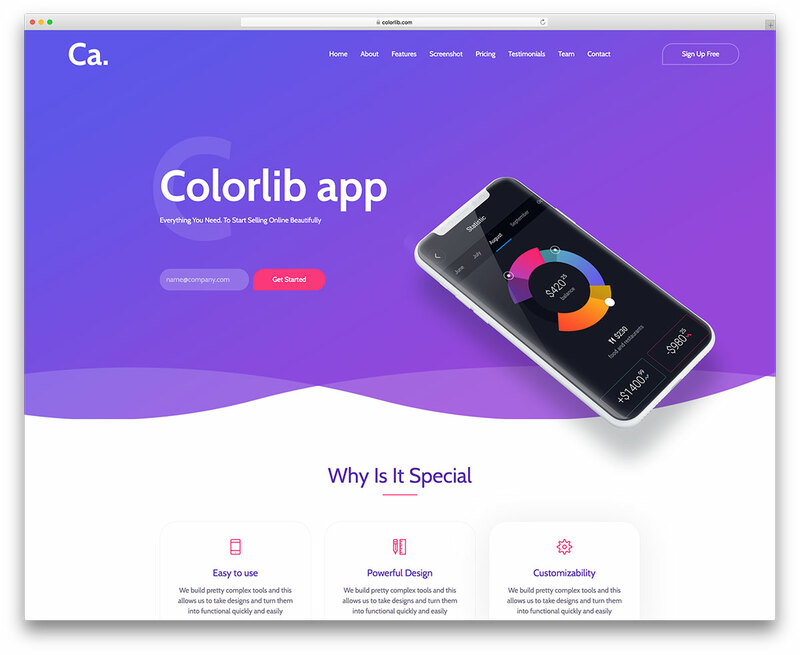 Along with the two layout styles, Cachet also sports other features like video background, smooth animations a sticky navigation and neat hover effects. There is also a functional contact form, widget-rich footer section and testimonials. For a quick website fix, Cachet could be your ideal approach to hammering out the best possible online presence for your project requirements. For an out of the box free Bootstrap 4 website template with a dark layout, Black is all you need. 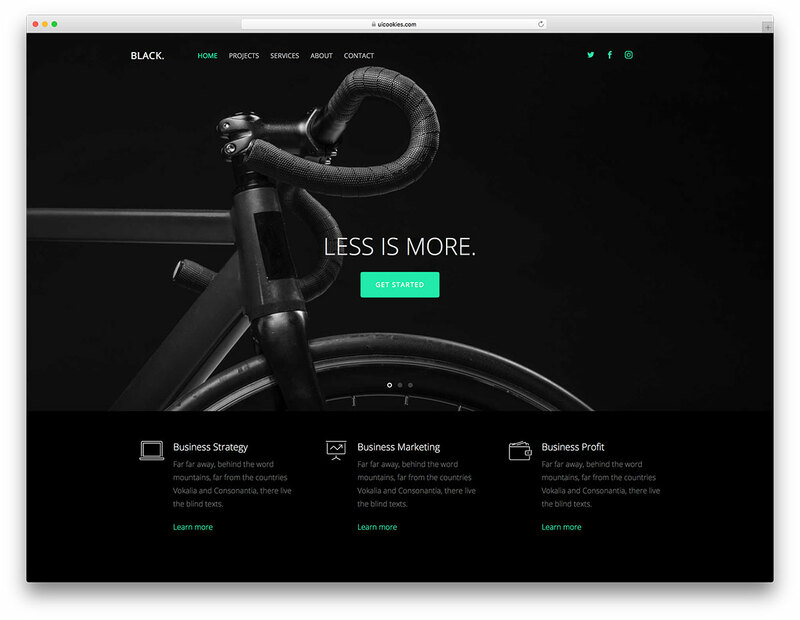 Black rocks the web space world with the “less is more” approach. If you are a minimalist who is looking to construct an internet appearance that will best resonate with you, again, Black is something you should consider. No need to be looking elsewhere, this is the right pick for you. Black is responsive, mobile and retina-ready, as well as compatible with popular browsers, perfect for business and corporate pages. Do see it live and you will immediately understand its power. 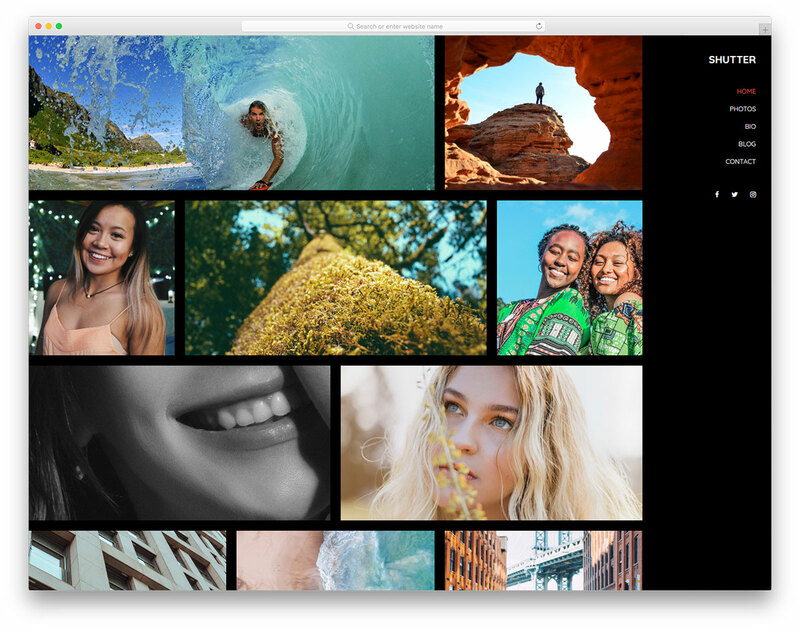 Black comes with a full-width slider, social media icons, video pop-up, accordions, on scroll content load and subscription form. Five different content pages are predefined and ready for you to use them to showcase all your company details. Speaking of which, along with index page, there are also sections for projects, services, about and contact. As far as the latter goes, it also has an integrated and functional contact form and Google Maps. For originality, simplicity and sophistication, you want to look into Connect. This free Bootstrap 4 website template is out of this world. While it tries and keeps the web design as minimal as possible, it still adds a distinctive touch to it with its split-screen look. If you have been looking for an ideal layout, you might just found yourself one. On top of that, Connect does not cost you anything, you just download it and start using it. Connect is responsive and pliable, making all your content instantly appear in the same stunning fashion on any device. It practices all the latest technologies what guarantees the top-notch experience across all platforms. 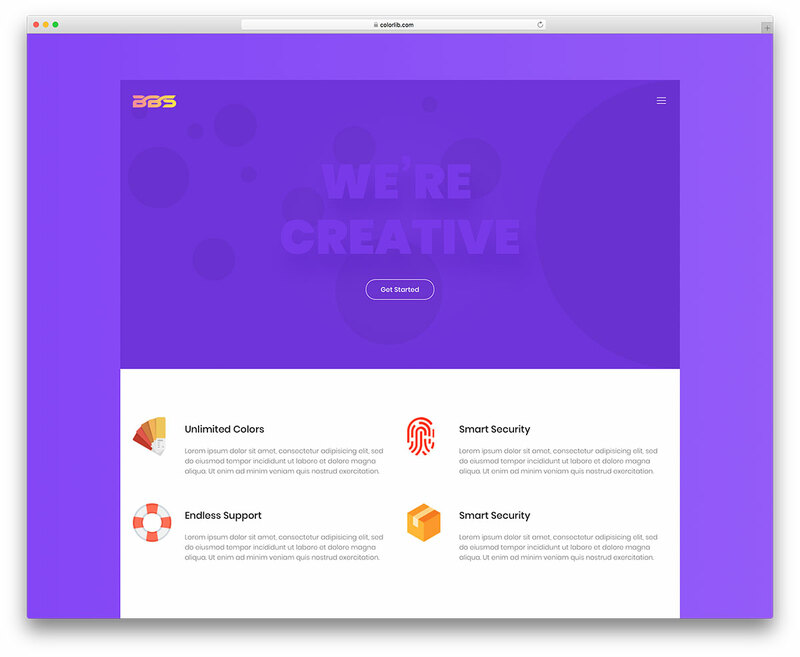 Excellent portfolio pages, gorgeous case study sections, footer reveal feature and smooth hover animations, Connect surely knows what it is doing. Differentiating yourself from the masses has never been easier. Owning a website is undoubtedly one of the best ways to promote yourself. No matter if you are a freelancer or an agency, it is a must to have a solid internet presence live at all times. People tend to use the internet more than anything else. That said, look no further and start the process today, it is free and reliable. And the tool that will serve you right is Format, a free Bootstrap 4 website template stuffed with ultimate assets. From head to toe, Format is a refined and optimized layout that helps you take your business to the Moon and then Mars. Scaling your project becomes way more manageable once you have the right equipment at hand, fully available for you to use it to its full potential. Some of the features of Format are on scroll content load, hover and parallax effects, widget-packed footer and a contact form. If you came all the way this far, you clearly need to dedicate some extra time of yours to X-Corporation. With such a powerful and cutting-edge free Bootstrap 4 website template, you can do many different things on the web. Sure, X-Corporation might be best for IT companies, startups and consultancy firms but you can use it for other projects as well. It is a lightweight, high performing and super customizable template that will easily meet your expectations. A professional user interface, mobile and retina friendly, optimized for search engines and stuffed with features, yes, I am still speaking about X-Corporation. As far as the assets go, X-Corporation sports mega, sticky and off-canvas menus, smooth scrolling, Google Maps and loads more. The template is also ready for you to convert it into your personal favorite CMS platform. For any help, you can always hit up the friendly support team and they will be excited to assist you. Hey, thanks. The templates are incredible. Awesome collection! You are welcome 🙂 Glad you find it helpful. Cheers! Thanks for adding my template in your list. Its “Infinity” .But you put wrong url or the author. Infinity was build by themefisher team. Hope you guys consider this issue and update the url. Oops, my bad. Thank you for noticing it. I just updated the links. 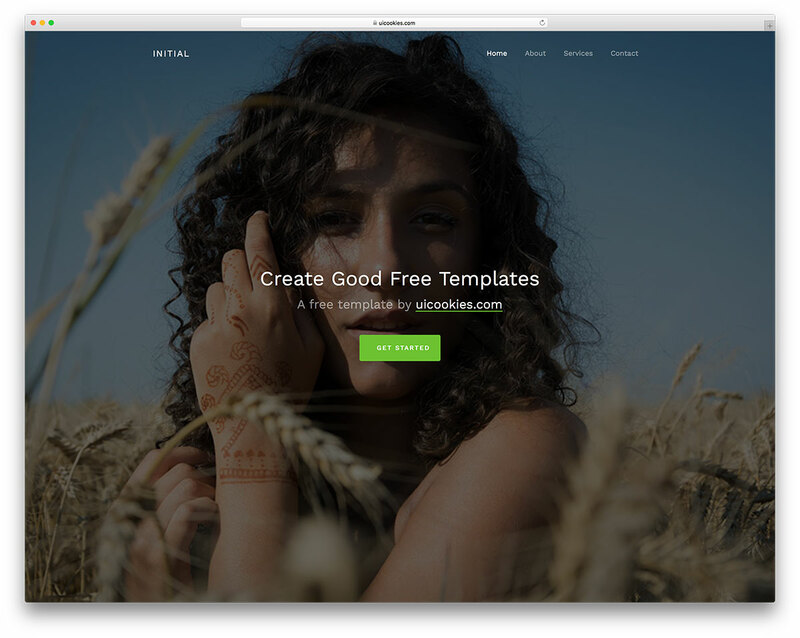 the title says 17 top free bootstrap 4 templates…but wait, they aren’t all free.. They are all free. Let me know which one isn’t and it will be removed from the list. Will soon be posting a link in the comments section with some of the top creations of my students..!! This is amazing templates are very much helpful for fresher developers to learn and implement new things. Using these templates you can make something new and innovative in your work. Thanks for sharing such a beautiful resources with us. Nice themes, thanks! 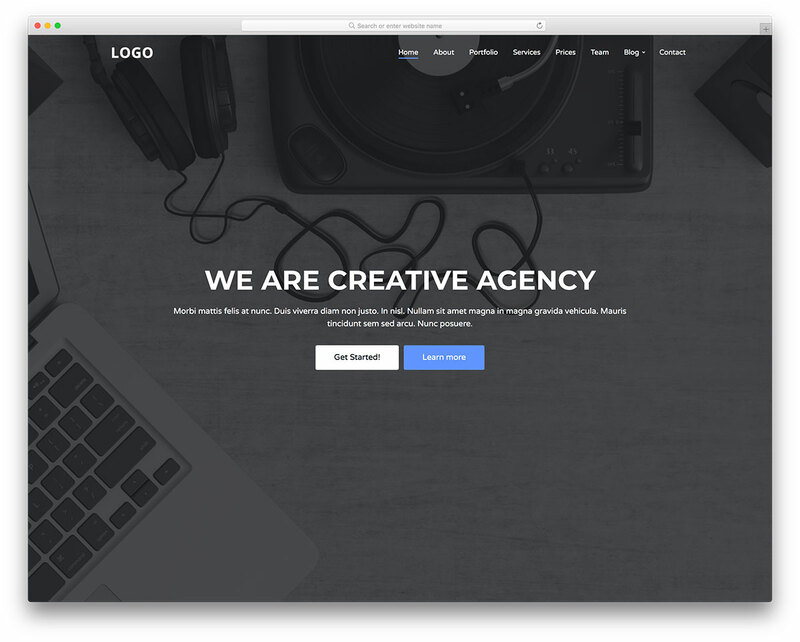 Please fix URL of the “Colid” theme – it points to “Creative Agency” for now. Thanks for reporting it! Url replaced. It’s not bootstrap 4, they’re still at 3, and all lie! You might want to check these as 90% of them are already using Bootstrap 4. Also, what is the reason for looking for Bootstrap 4 templates specifically? No, all of them are Bootstrap 3. Your article title say Bootstrap 4, which is wrong. Do you know how to check if a template is built with Bootstrap 3 or Bootstrap 4? Simply open the Bootstrap CSS file of the template and see the Bootstrap version in the CSS file, you will see all of them are listing Bootstrap 3.x.x version. May I ask what difference it makes for you as a user if it is Bootstrap 3 or Bootstrap 4? For us developers, it makes a minor difference, for end user there is virtually no difference at all other than the bragging rights that this is based on Bootstrap 4. Please let me know your opinion on that. I have been working with Bootstrap since the day it become available in 2011. People overestimate the importance of the latest version especially for end users. Such a wonderful list of Bootstrap4 templates. I always find these types of templates for my website. Thank you for this amazing list. your article is wonderful. These are the best templates i have found.